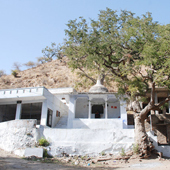 Kailashpuri, the modern name for the town of Eklingji, 22 km. 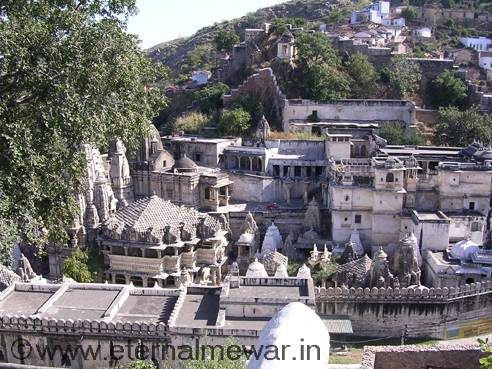 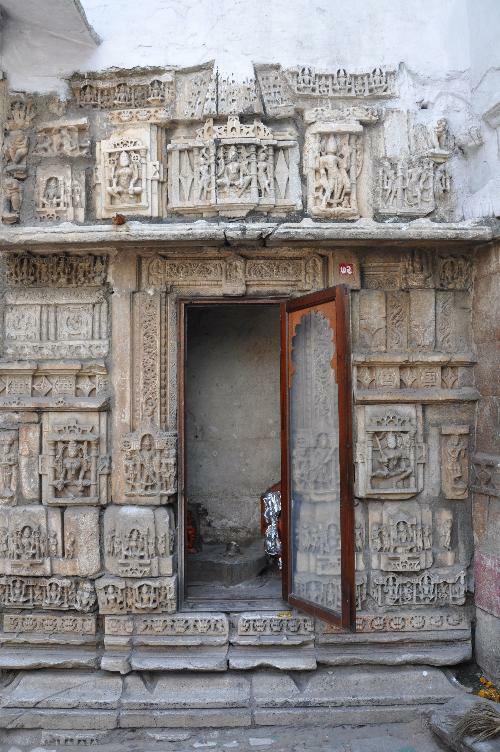 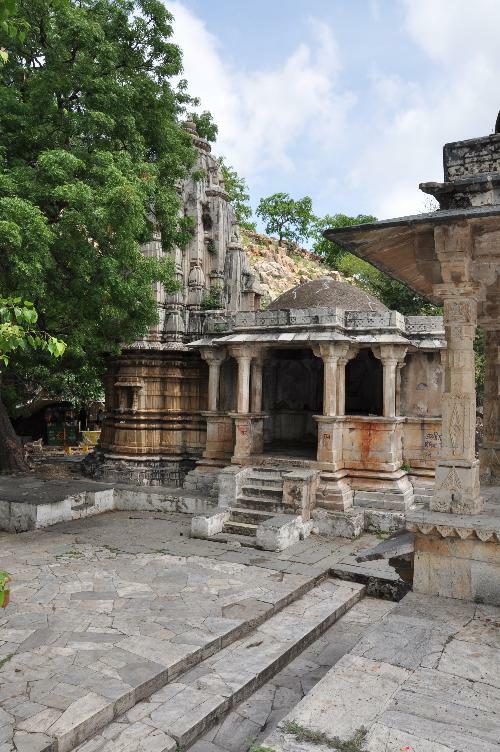 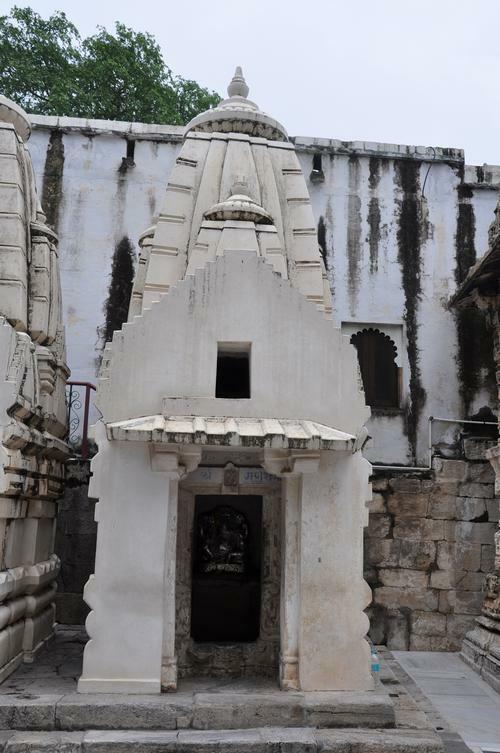 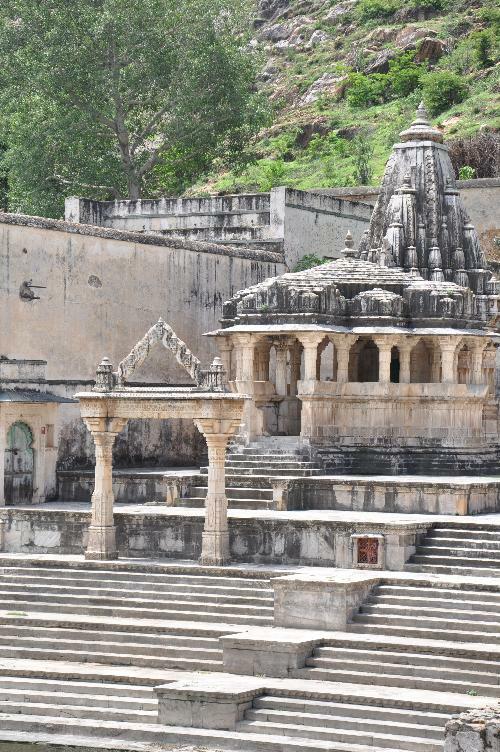 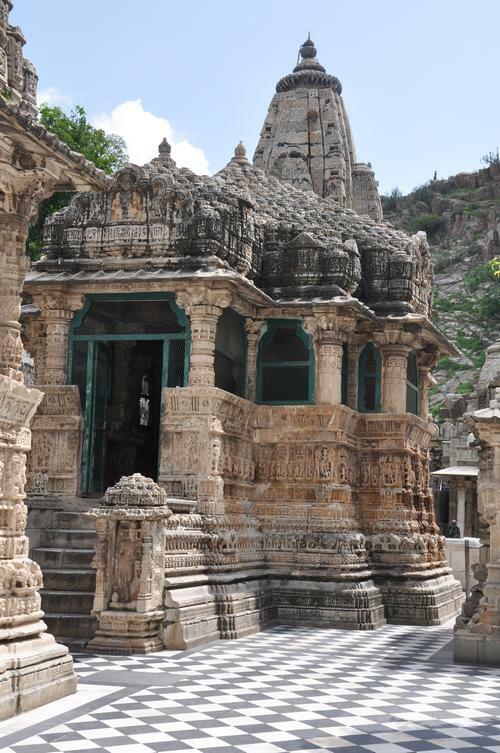 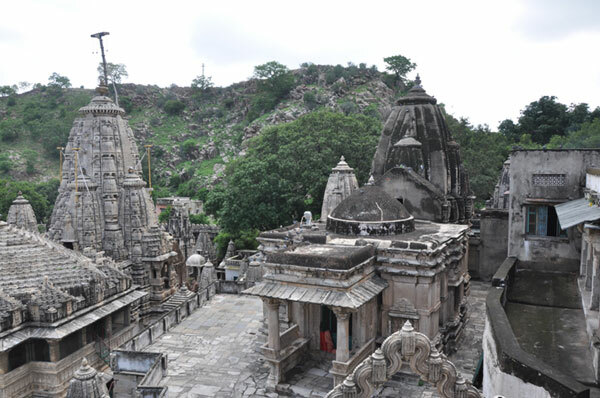 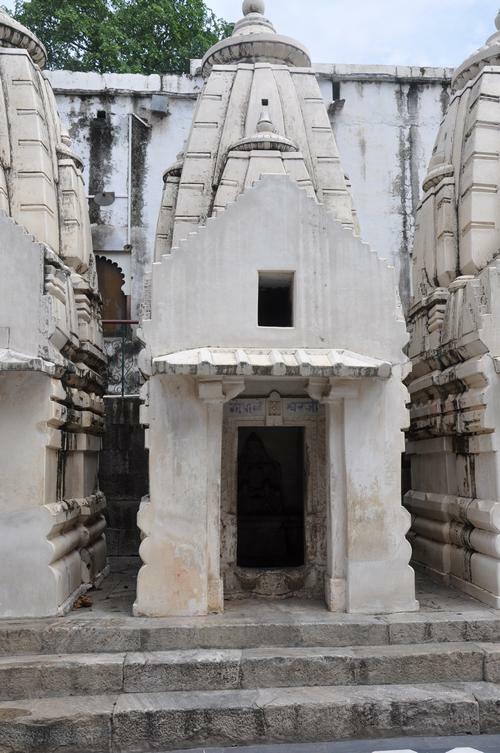 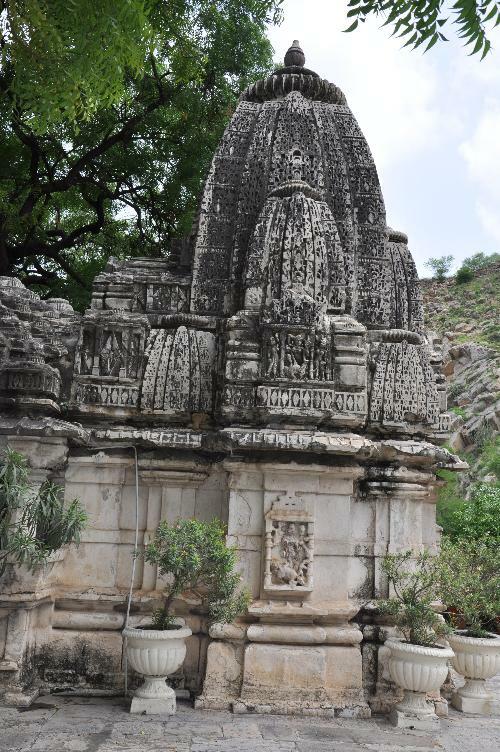 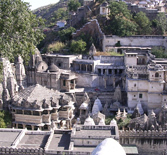 north of Udaipur is famous for its one hundred and eight temples enclosed by a high, fortified wall. 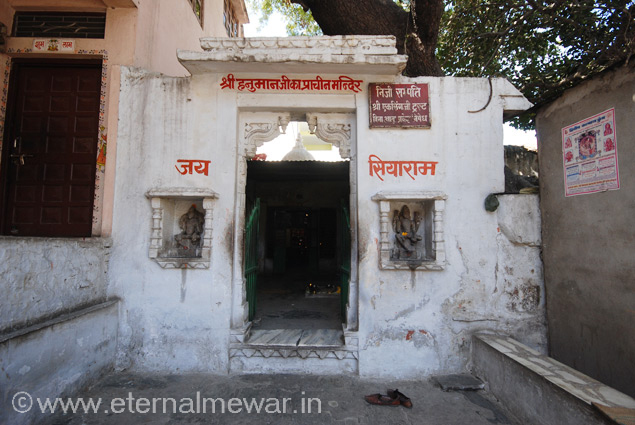 Shree Parmeshwaraji Maharaj, the principal deity of Shree Eklingnath ji Temple is the personal family deity of the Maharanas of Mewar. 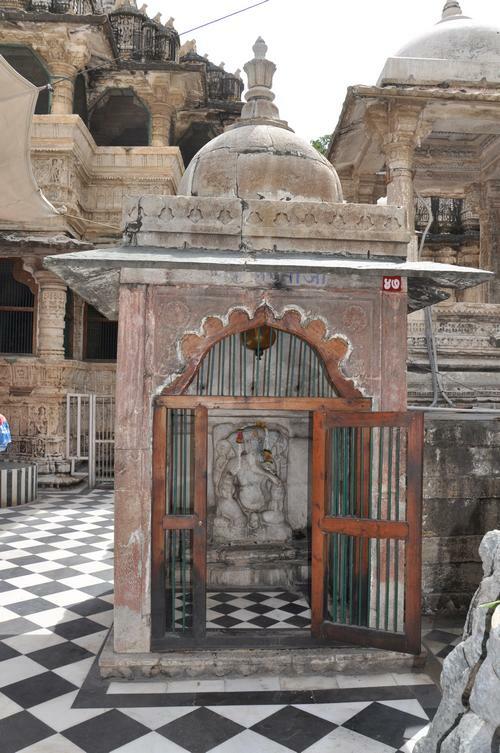 Founded by Bappa Rawal, the Shrine itself is as old and ancient as the State of Mewar. 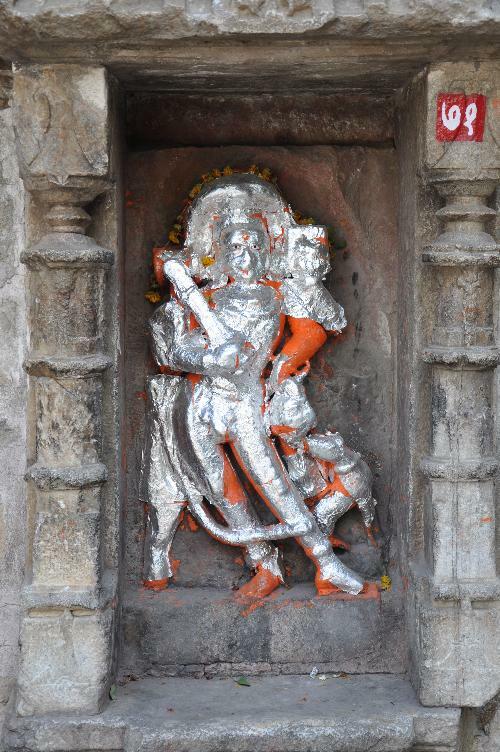 Eklingnath ji is a manifestation of the Hindu god, Lord SHIVA. 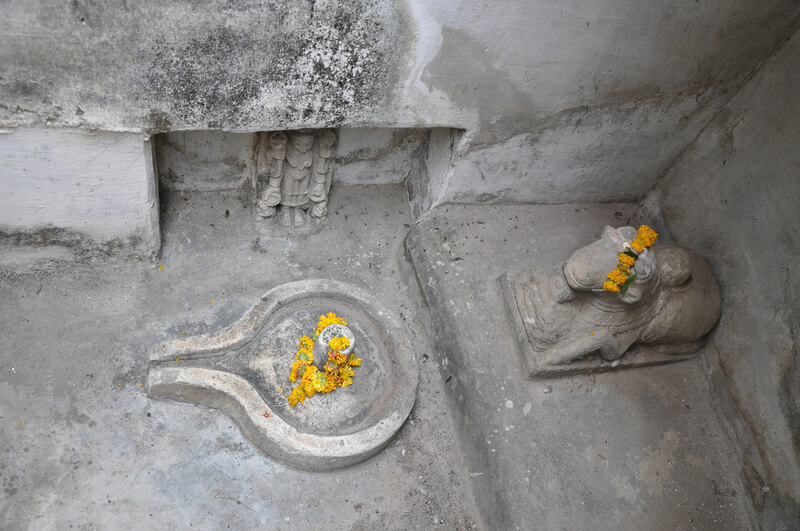 'Ek' means 'one', 'ling' refers to lingam (Phallus), the life-giving phallic symbol of Shiva, and 'ji' is a widespread suffix of respect in India. 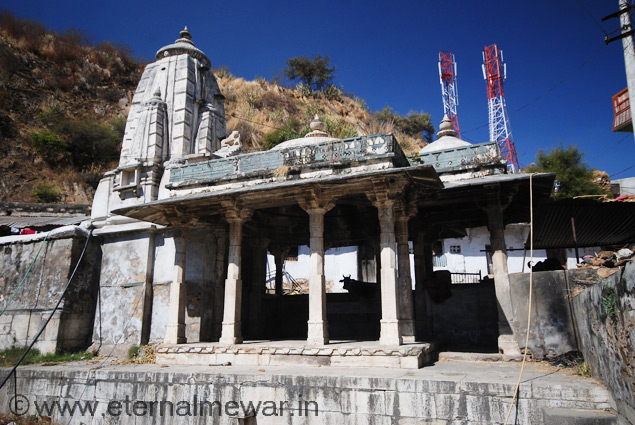 Eklingnath ji has been the deity of Mewar's rulers since the reign of BAPPA RAWAL (r. 734-753 AD). 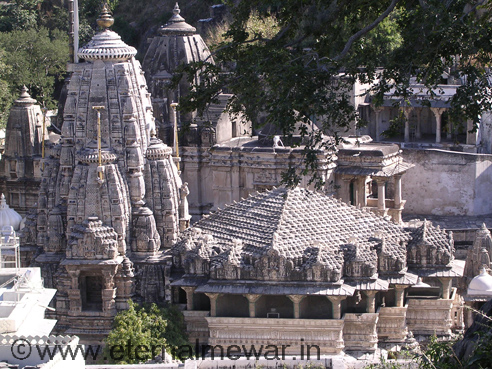 Though crowned and invested with the insignia of royalty, they have acted as DIWAN (Prime Minister or, more appropriately, Trustee) for the God of his State of Mewar. 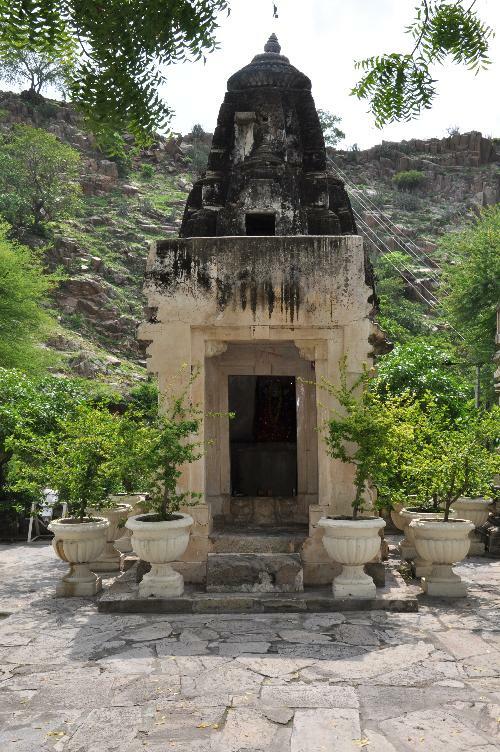 Traditionally, BAPPA RAWAL (r. 734-753 AD), founder of the Mewar Dynasty, built the original Shrine. 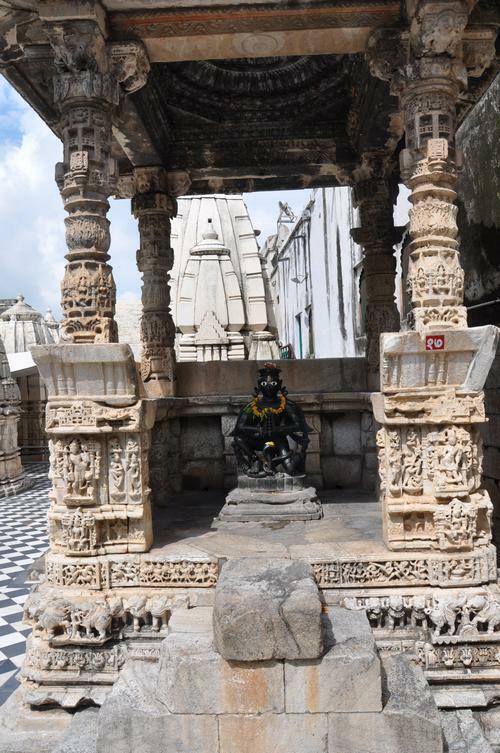 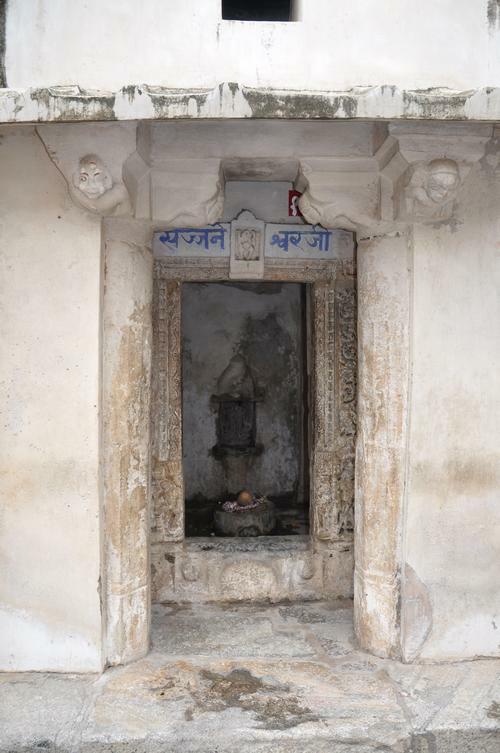 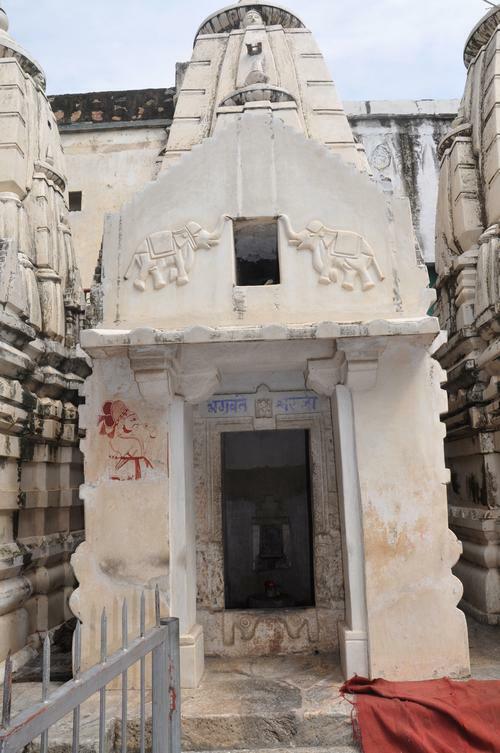 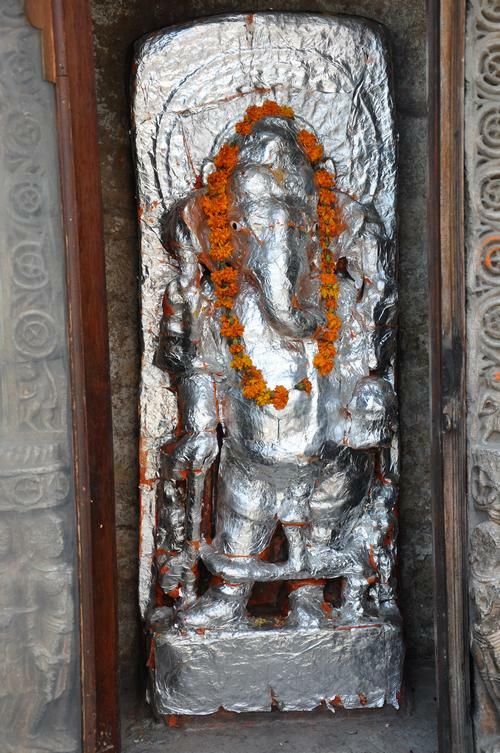 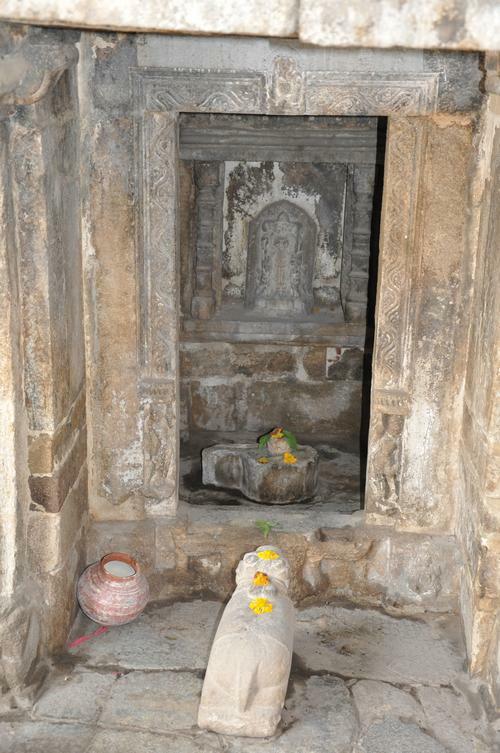 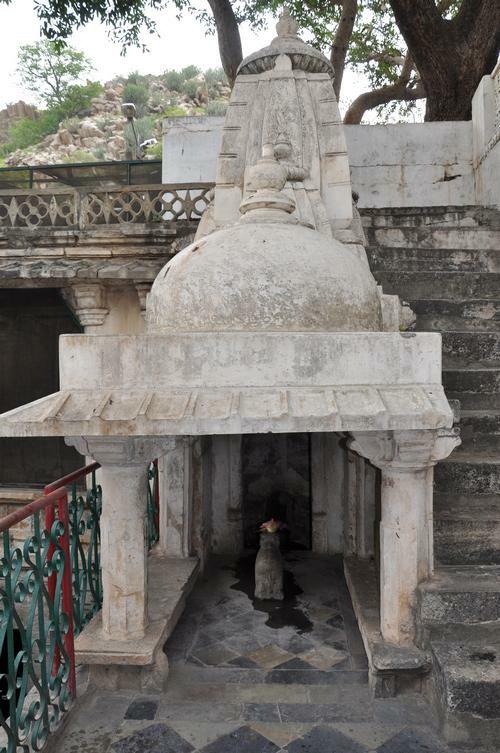 On this site it is said he received religious education from the sage, MAHARISHI GURU HARIT RASHI who meditated in a nearby cave that houses a Shiva Lingam, and where Bappa received the guru's blessing and code of conduct, which has always been the main guideline of the Mewar Dynasty. 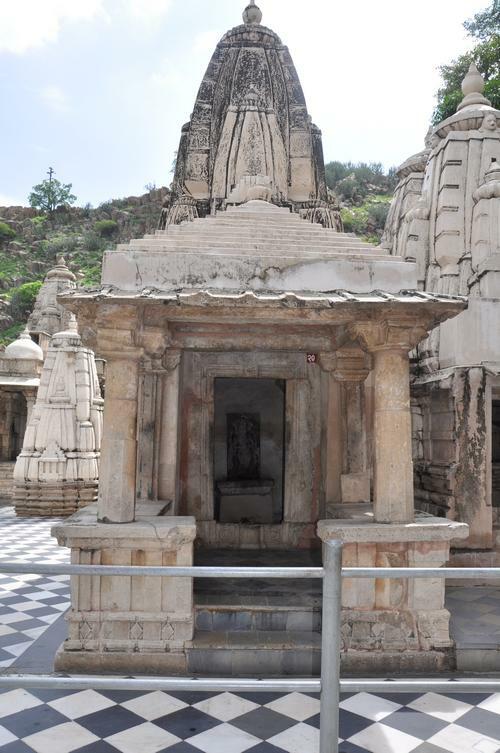 The temple has been rebuilt and refurbished by MAHARANA MOKAL (r. 1421-1433 AD) and the present idol was installed by MAHARANA RAIMAL (r. 1473-1509 AD). 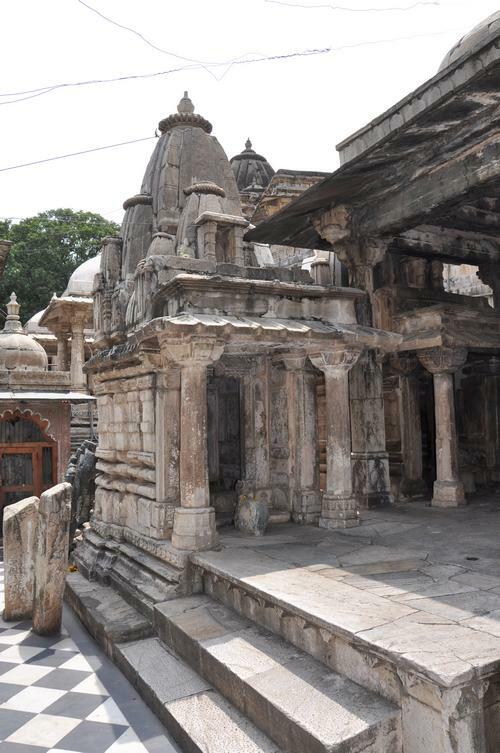 However, architecturally, the present day structure is of a later date and bears no sign of the 8th century. 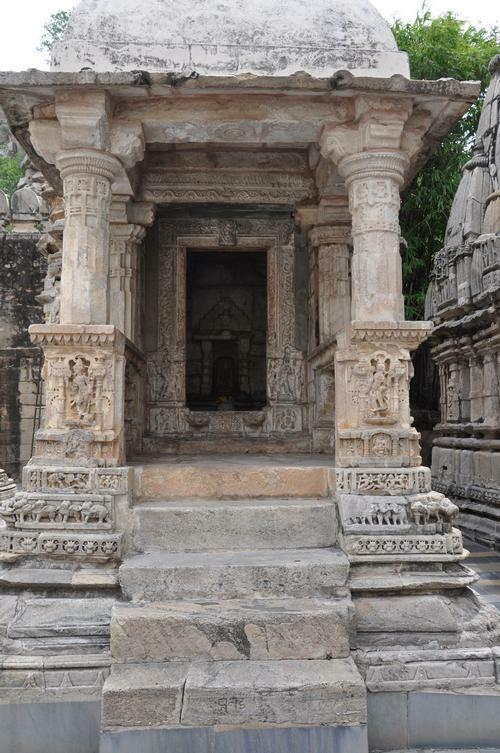 It is made entirely of white marble. 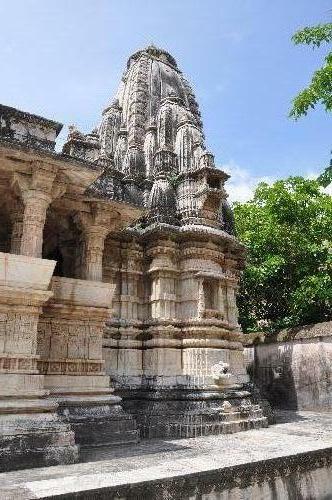 The walled boundary of the temple has 108 Shrines as well as the main Temple, which consists of a double-storeyed assembly hall and a flat, pyramidal roof that is adorned with hundreds of circular knobs and crowned by a tall tower. 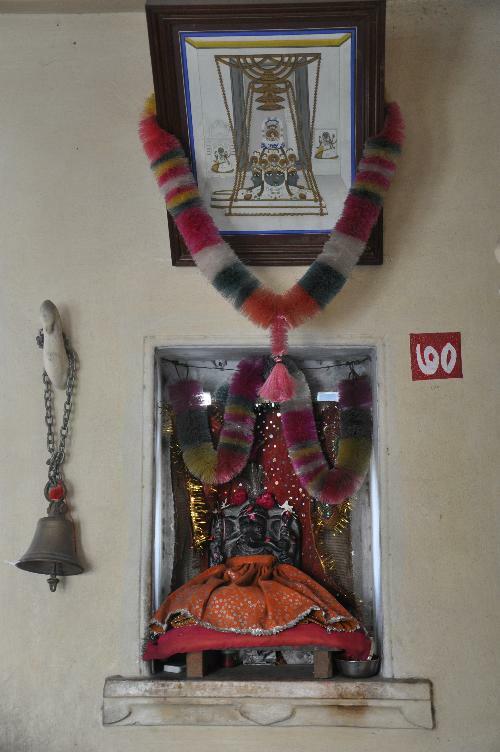 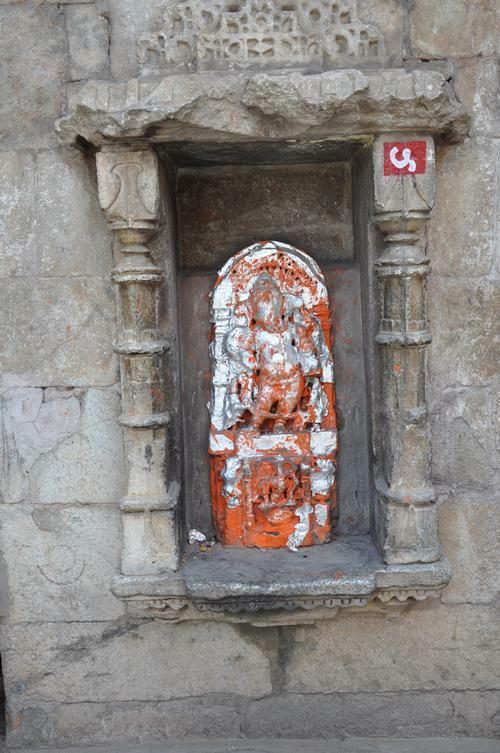 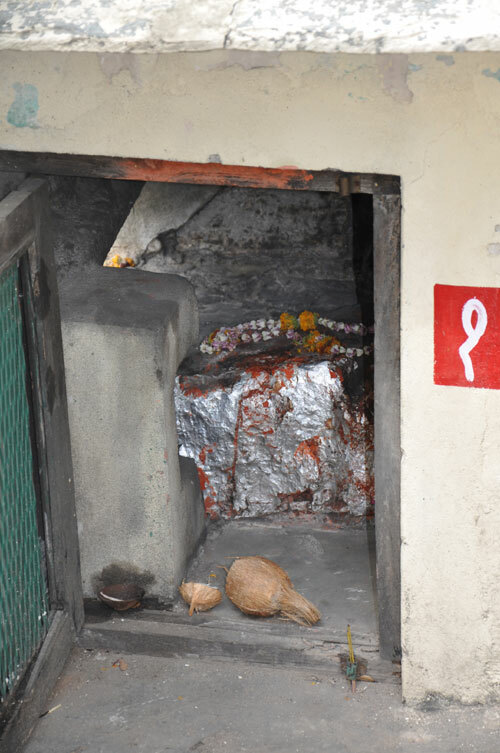 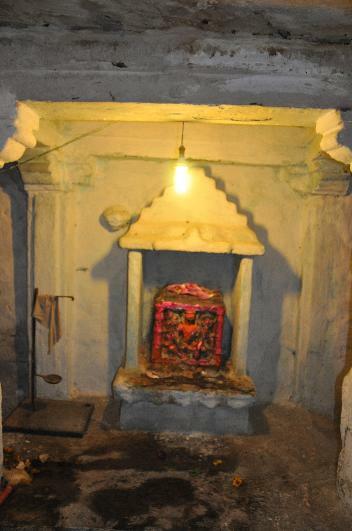 A four-faced idol of Lord Eklingnath ji, made of black marble, is in the inner sanctum sanctorum. 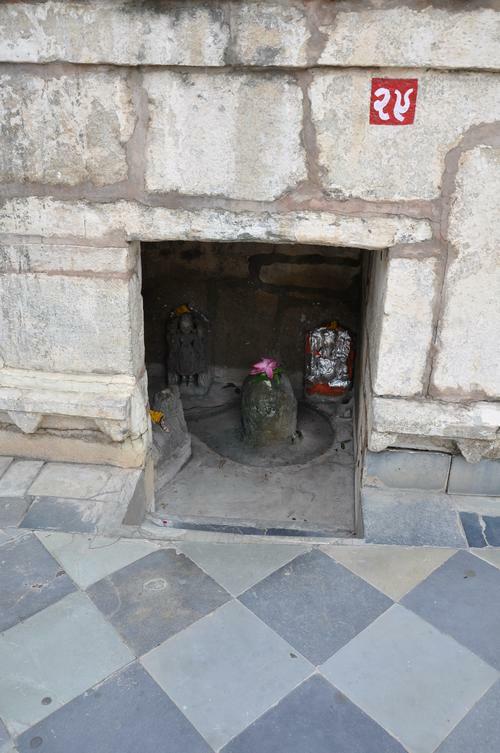 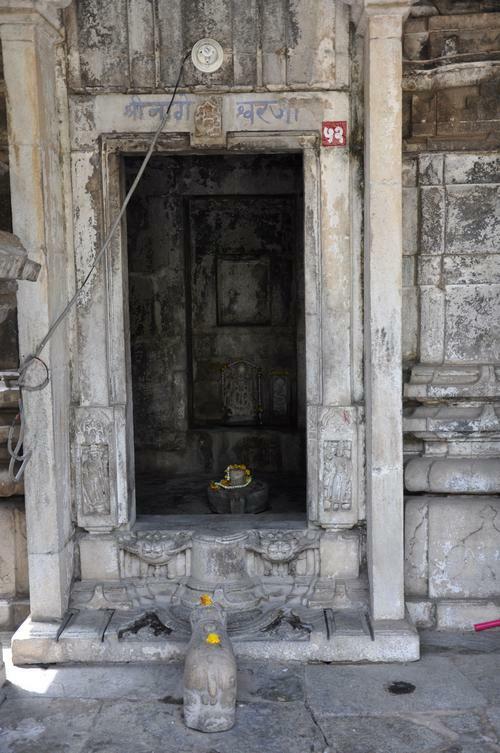 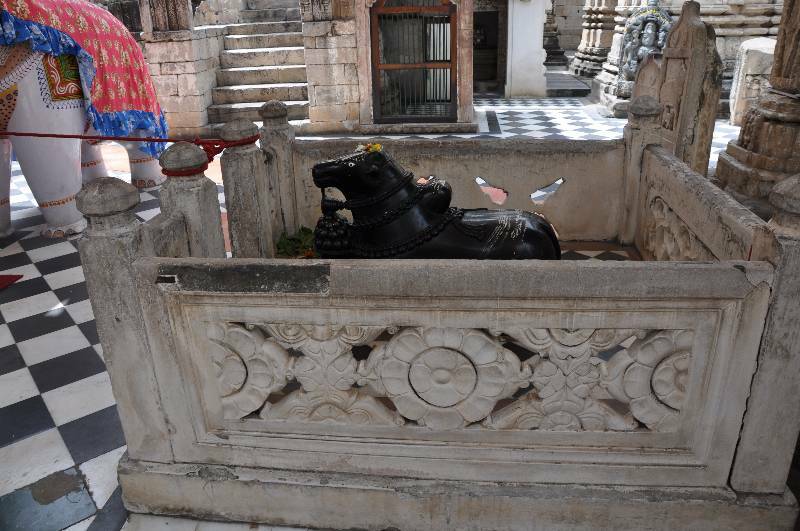 Outside the temple is a small silver statue of Shiva's sacred bull, NANDI. 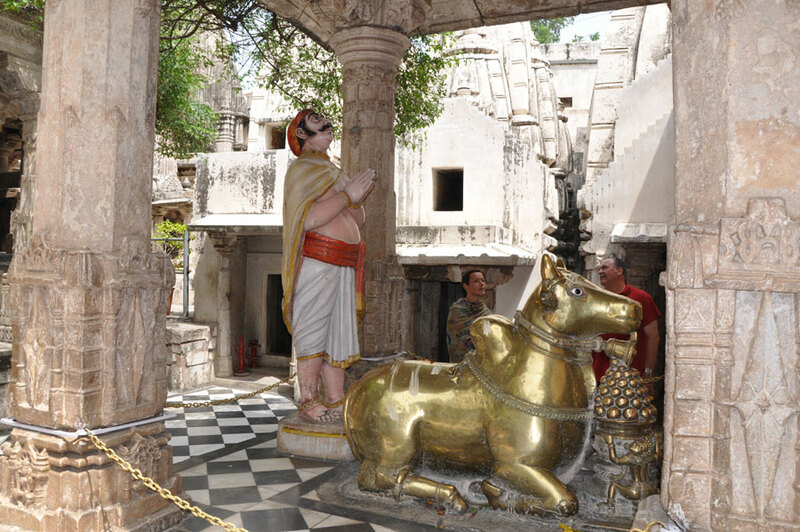 Facing the Nandi is a statue of Bappa Rawal, standing with clasped hands. 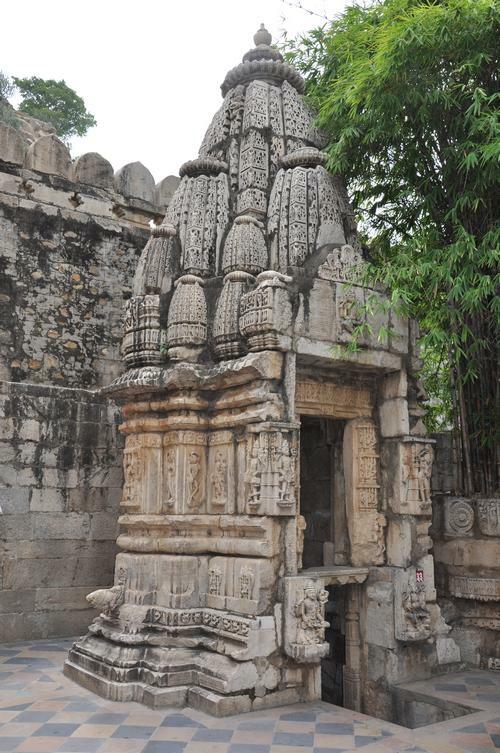 The temple complex is located on the shore of Indersagar Lake. 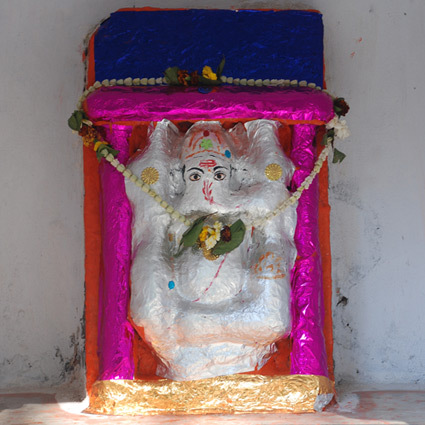 About 1 k.m. 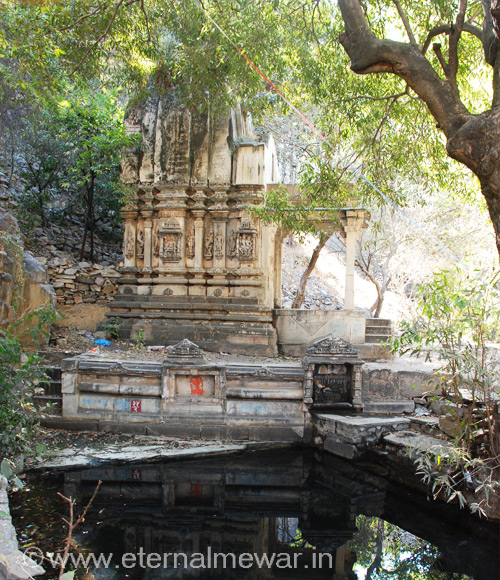 beyond the temple is the cave of Bappa Rawal, which is now a pleasant picnic spot. 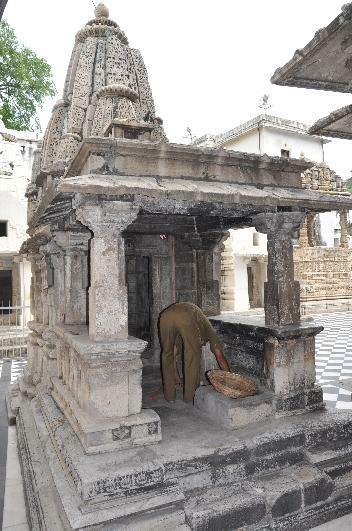 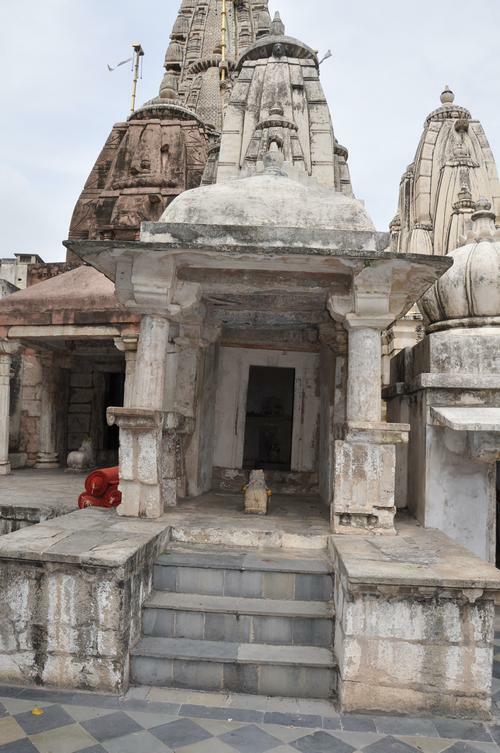 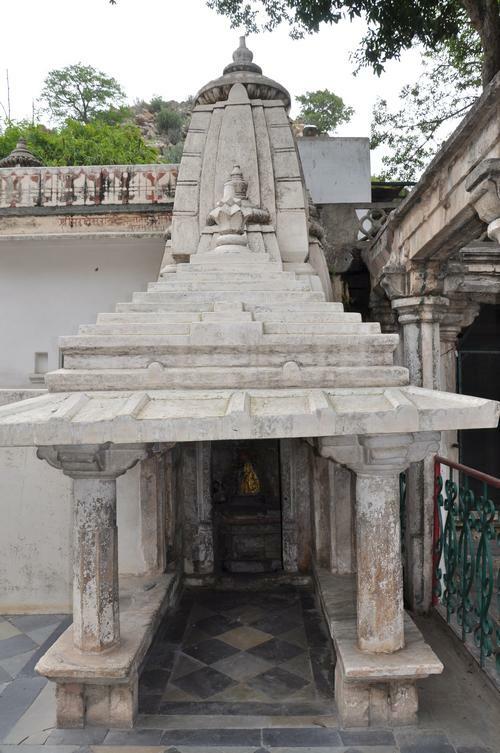 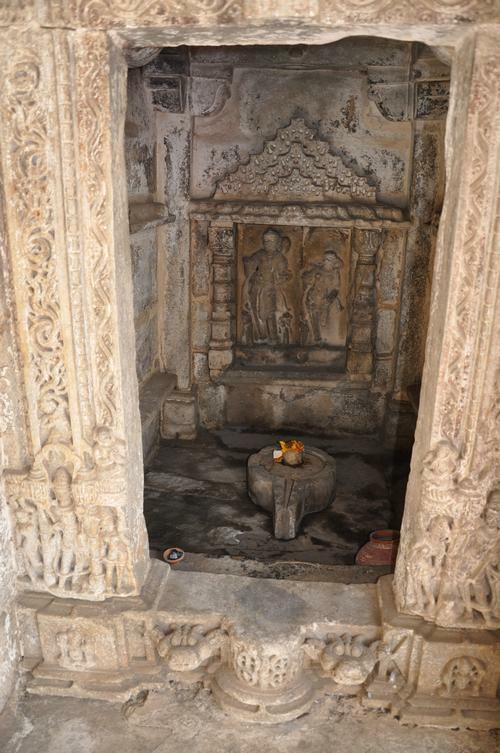 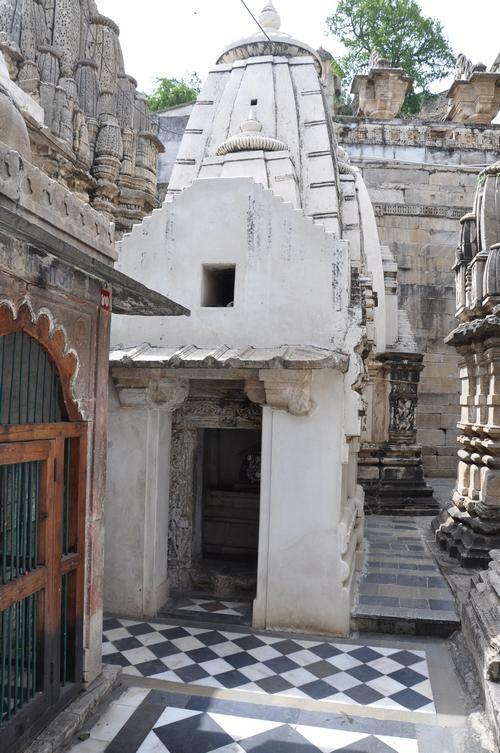 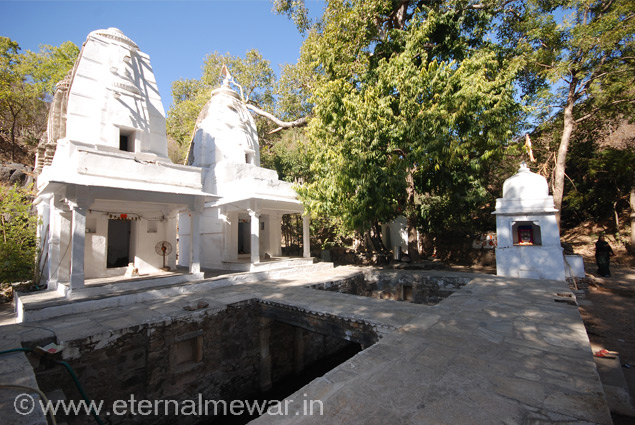 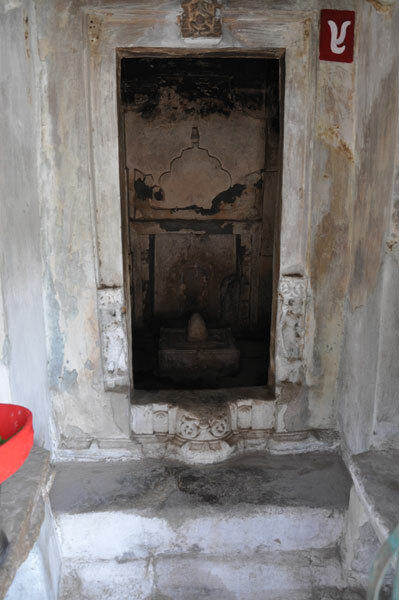 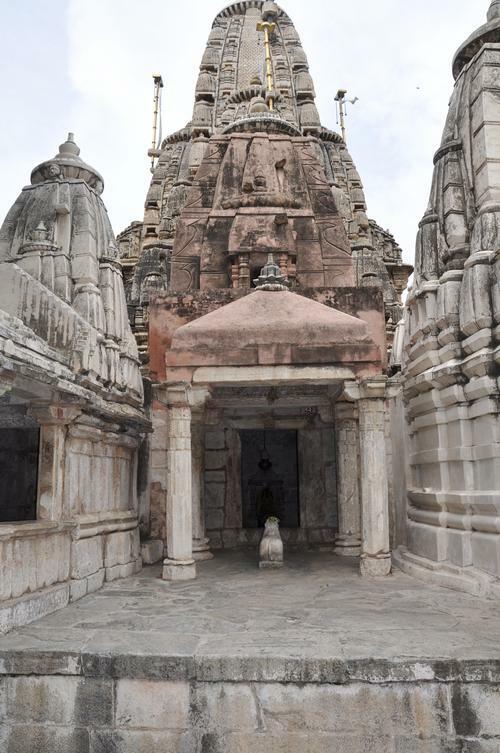 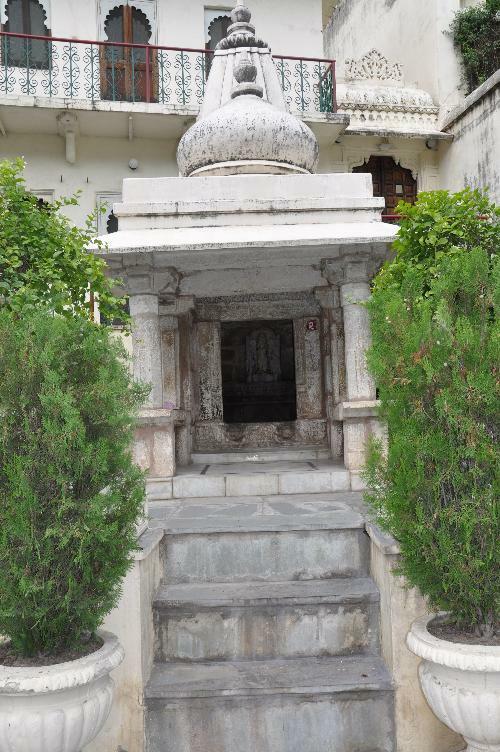 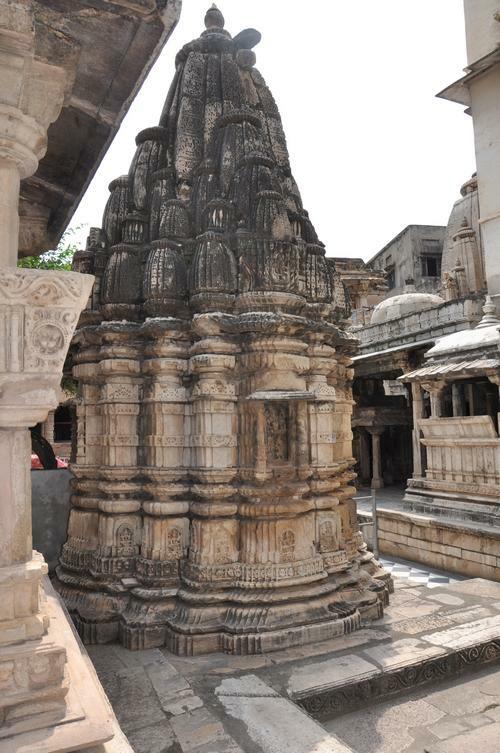 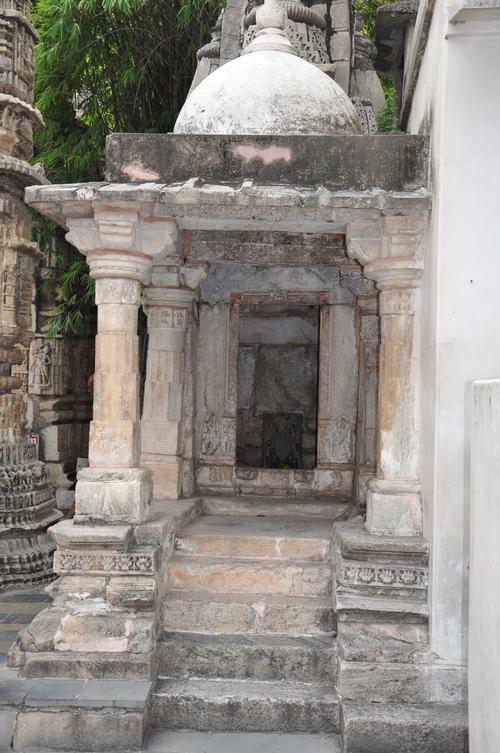 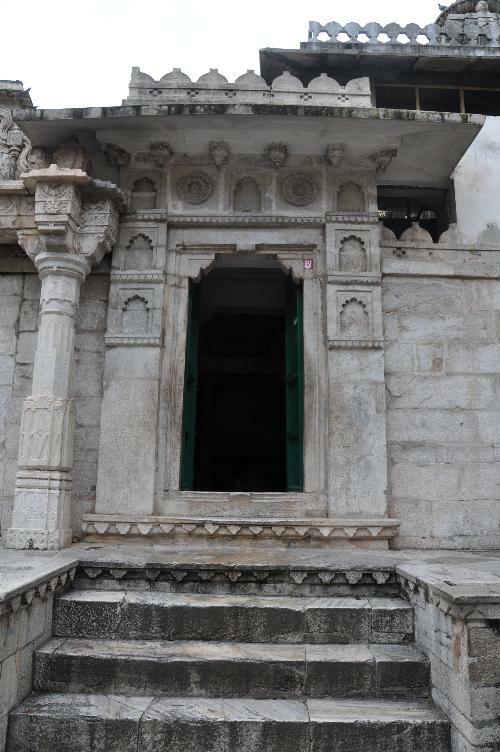 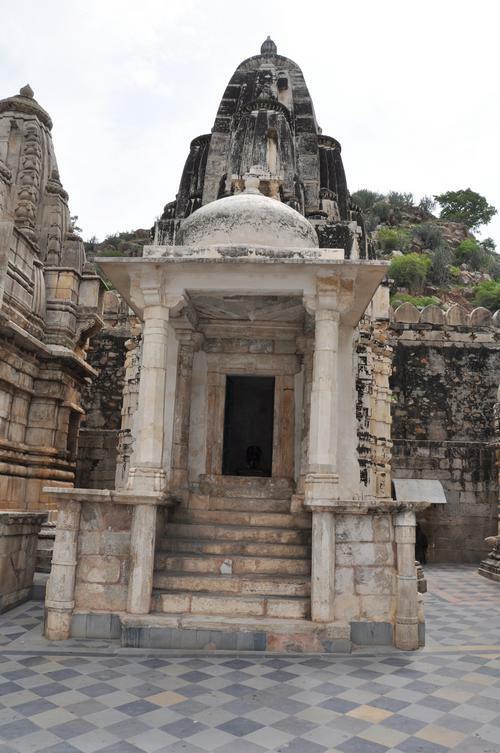 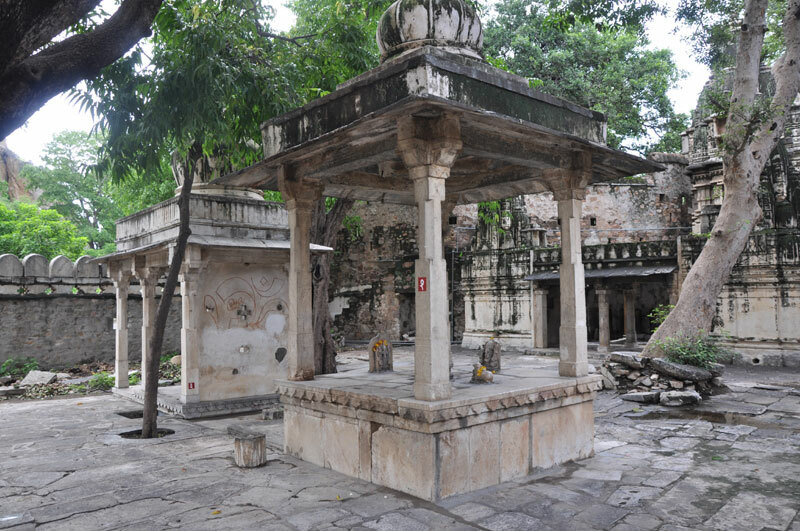 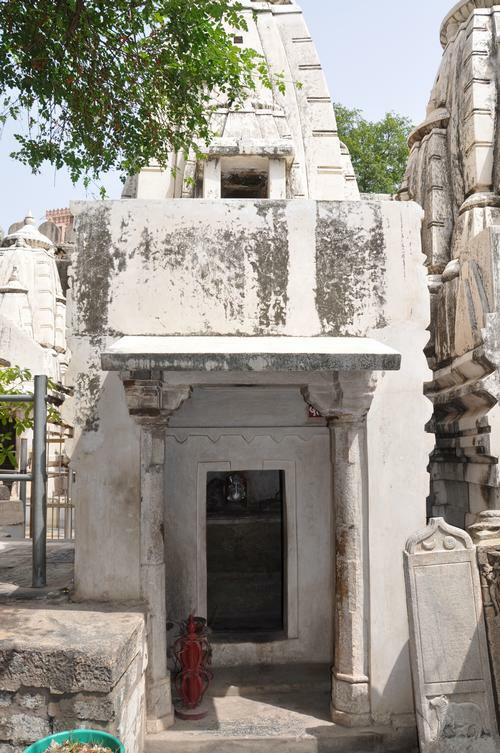 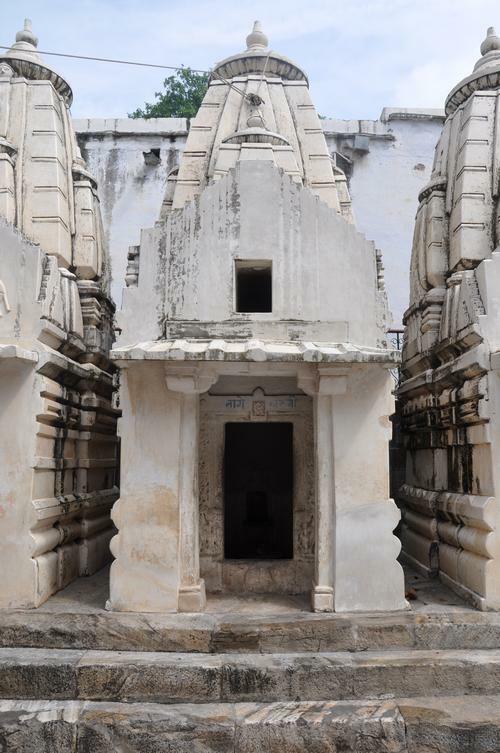 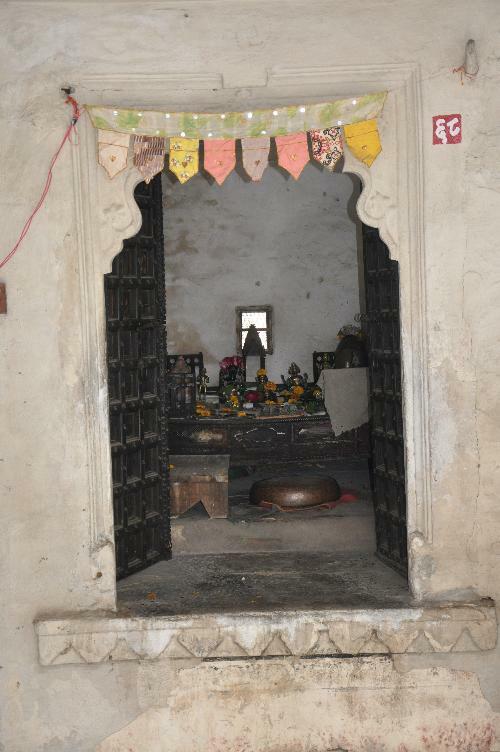 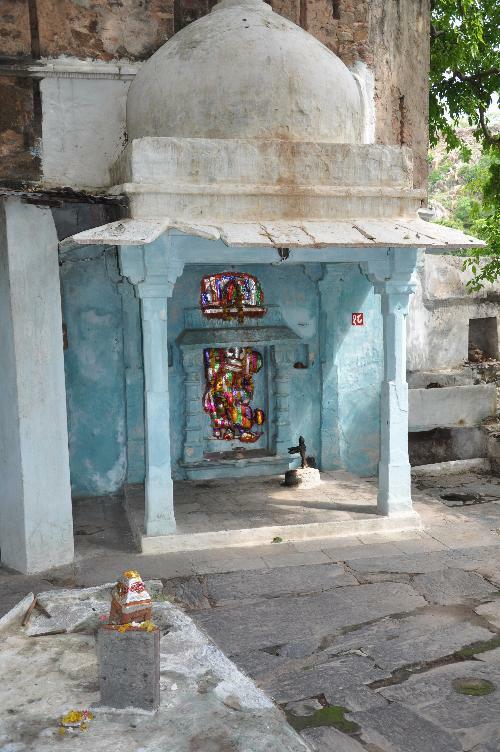 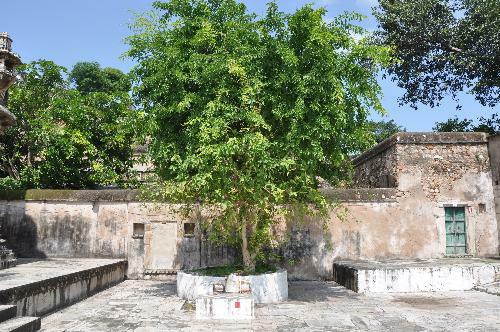 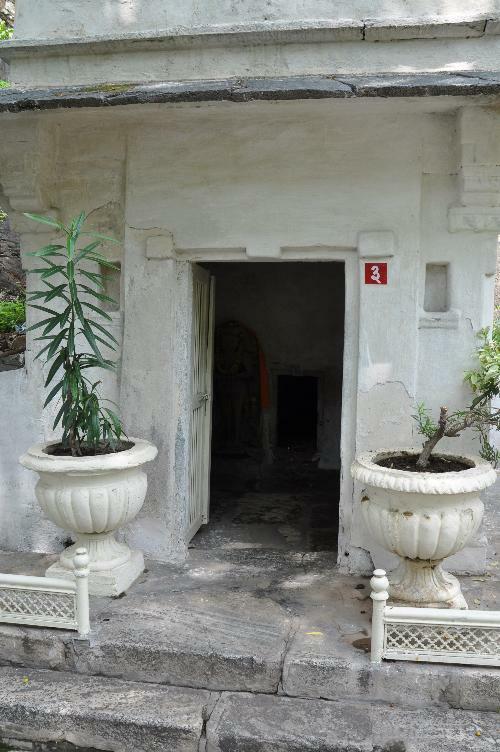 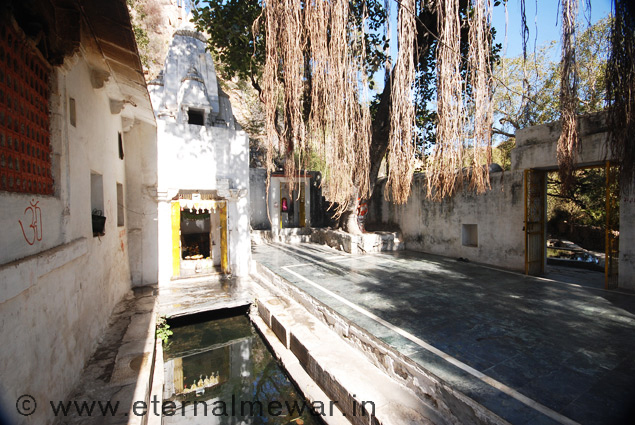 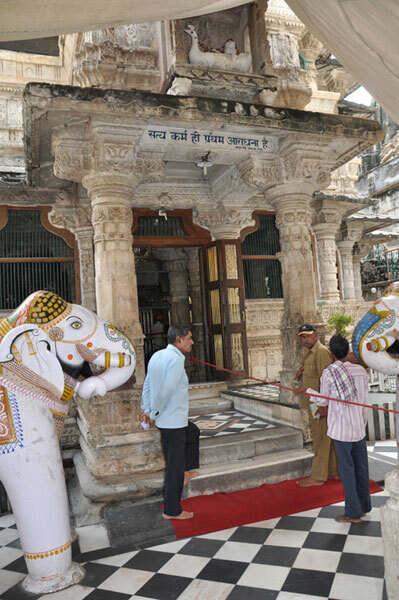 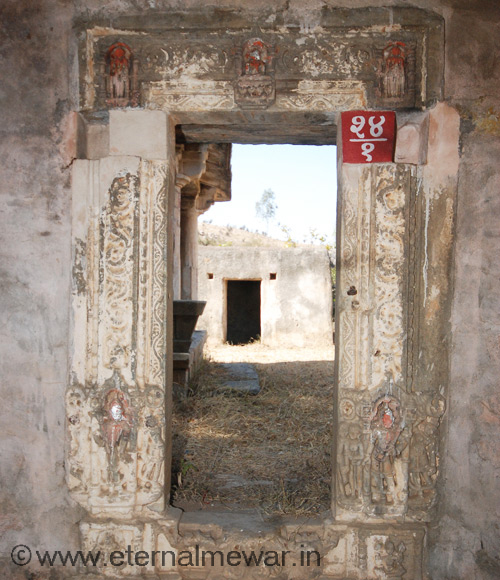 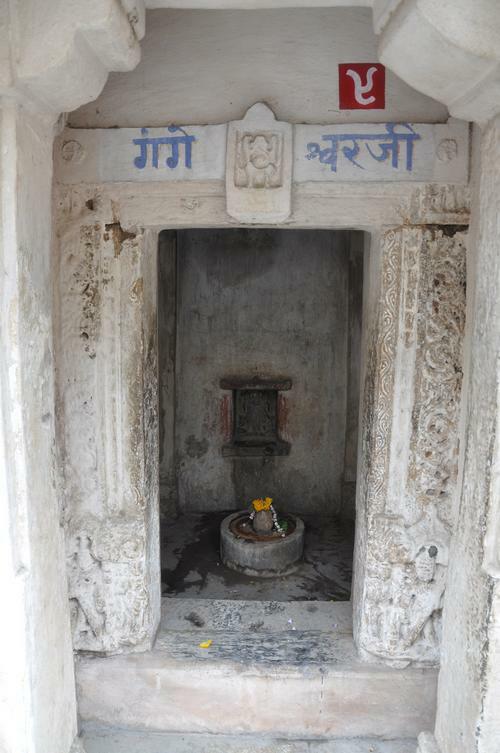 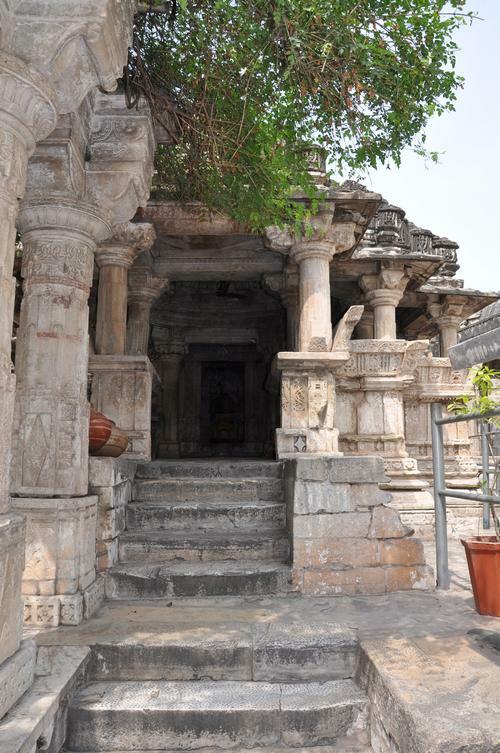 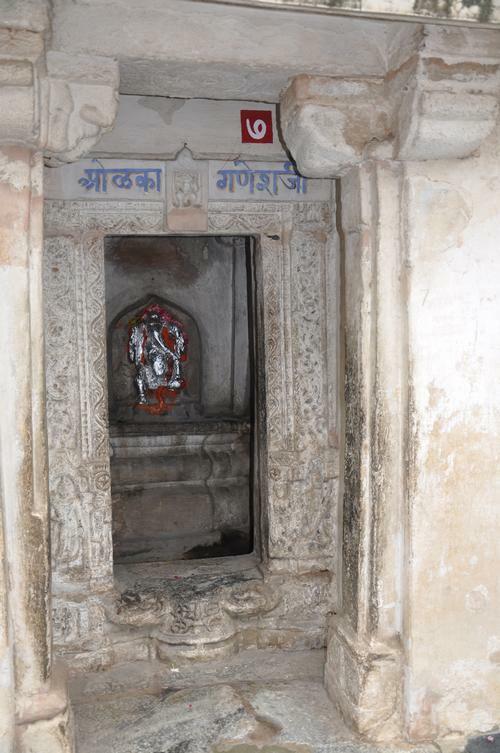 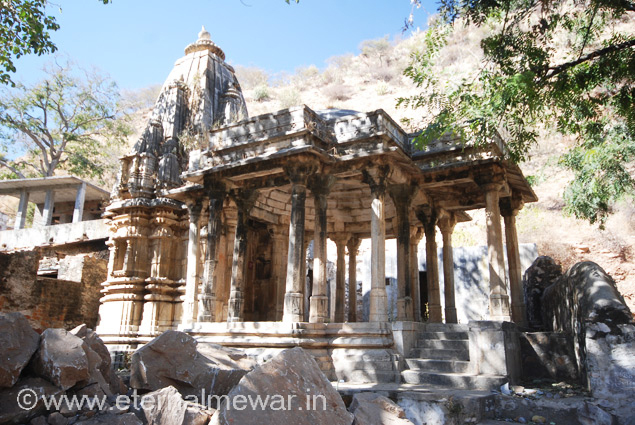 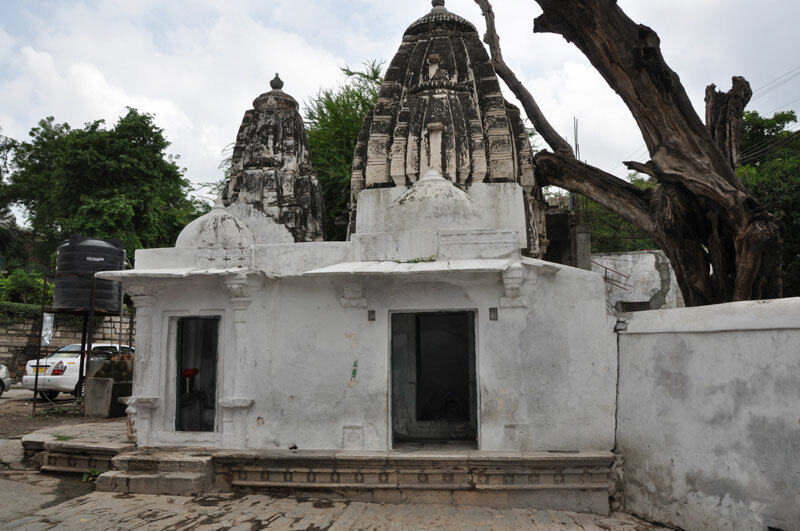 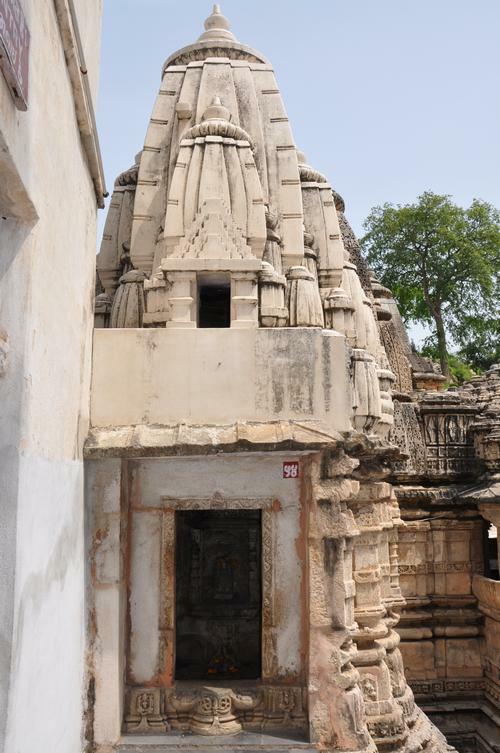 Traditionally, BAPA RAWAL (734-753), founder of the Mewar Dynasty, built the original shrine. 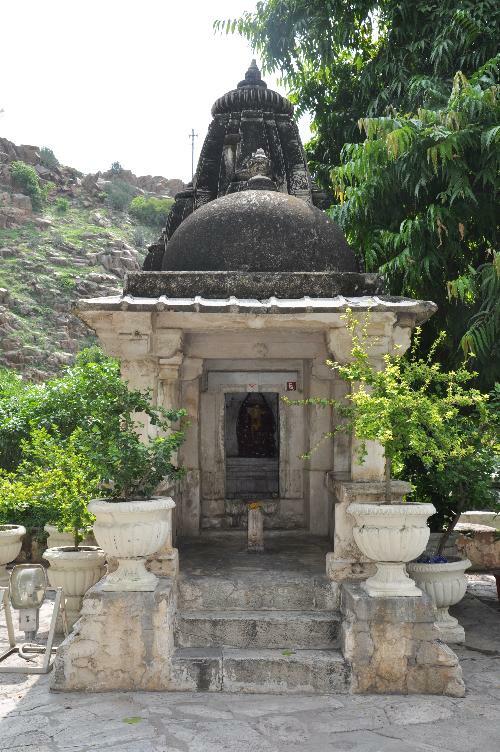 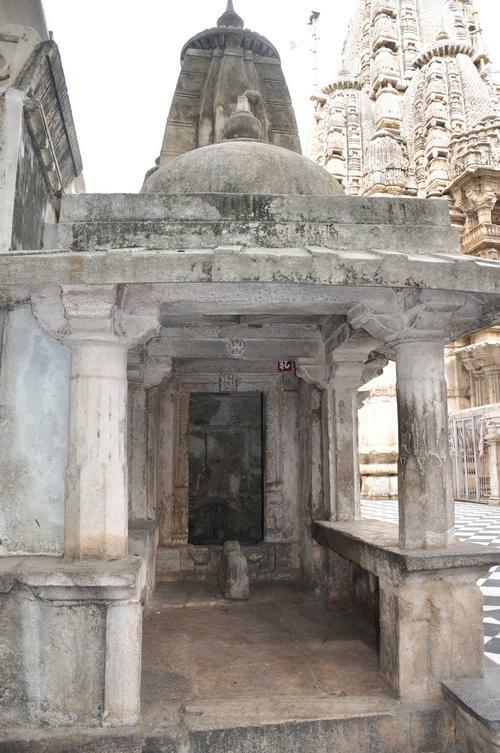 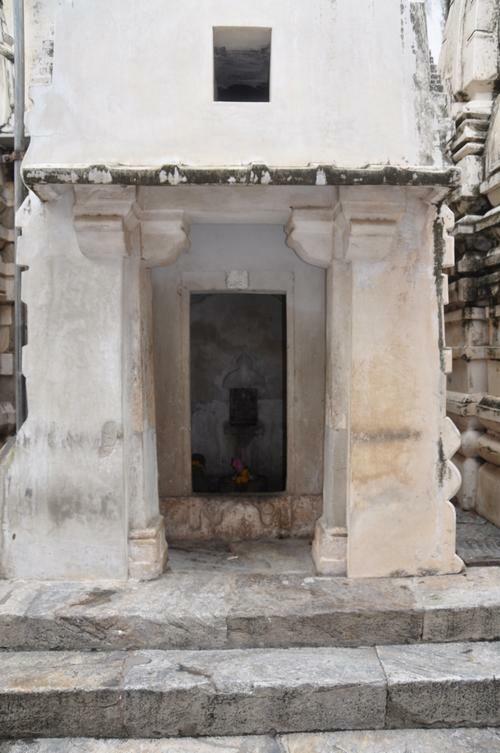 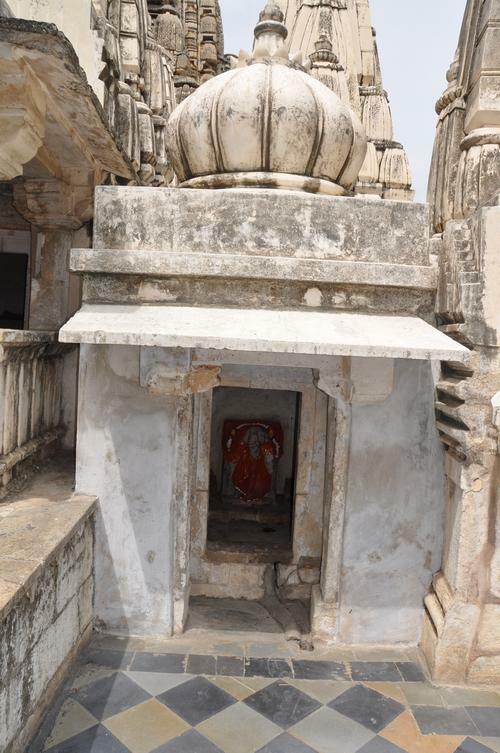 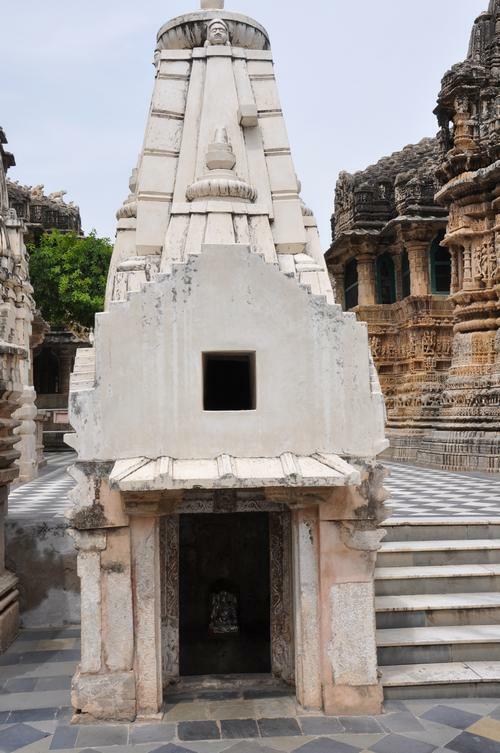 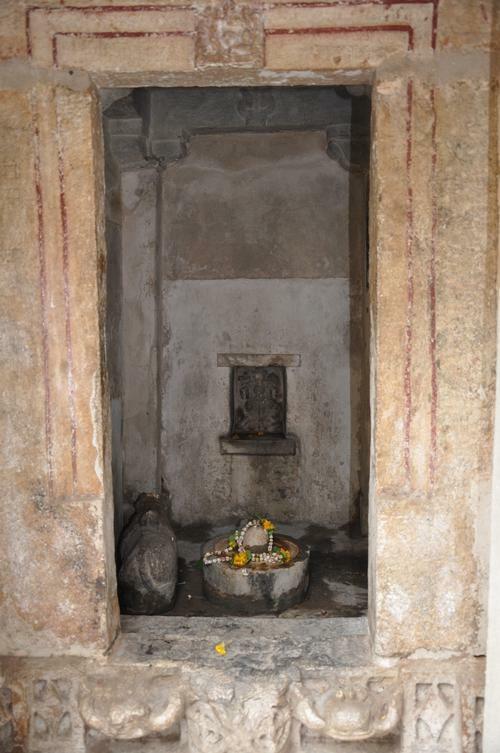 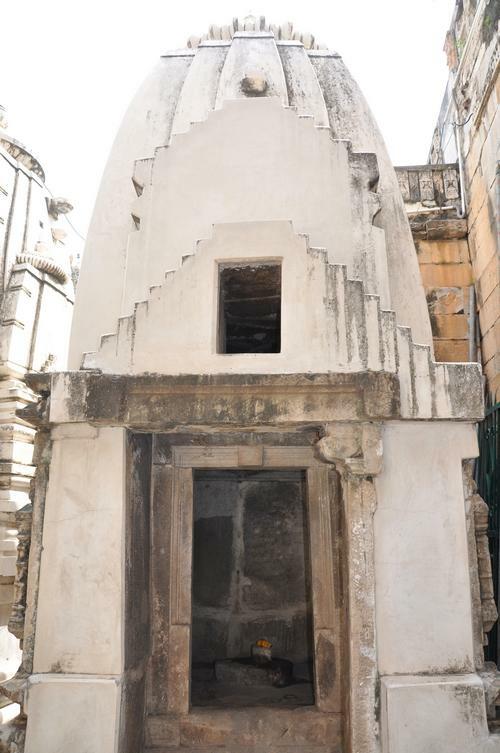 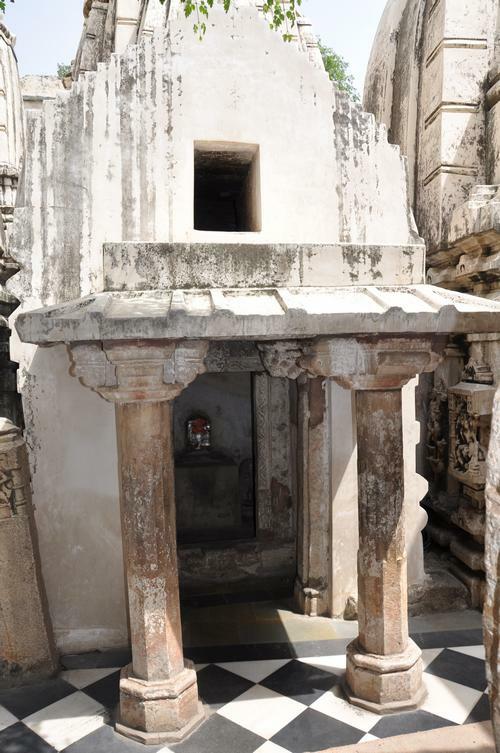 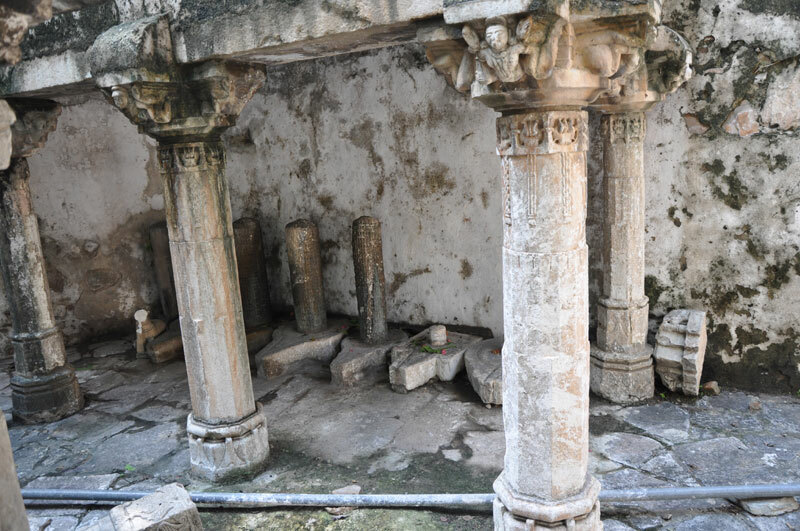 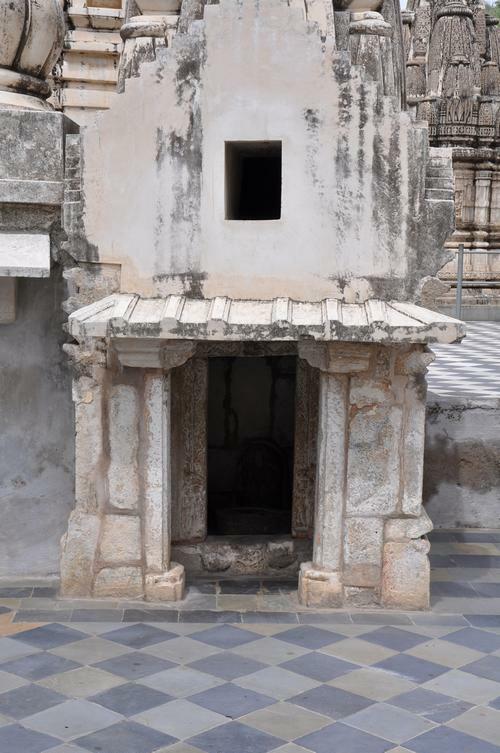 On this site it is said he received religious education from the sage, HARIT RASHI who meditated in a nearby cave that houses a Shiva Lingam, and where Bapa received the guru's blessing and code of conduct, which has always been the main guideline of the Mewar Dynasty. 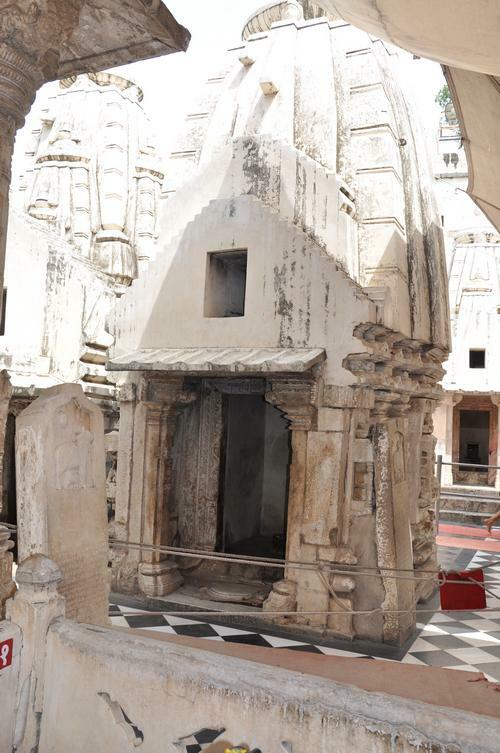 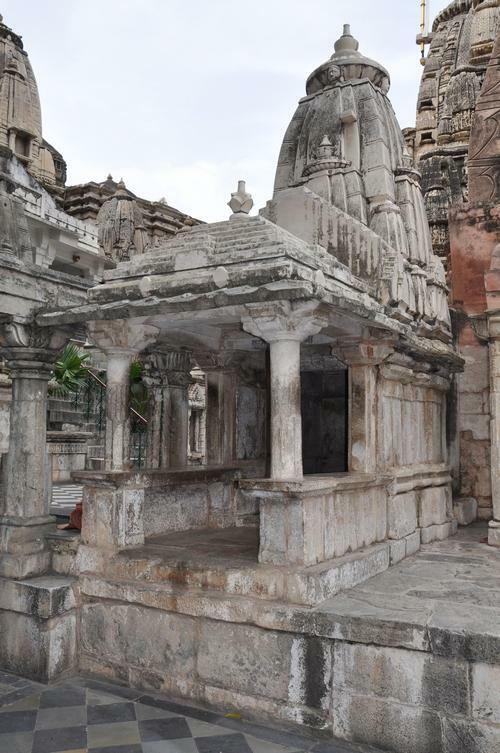 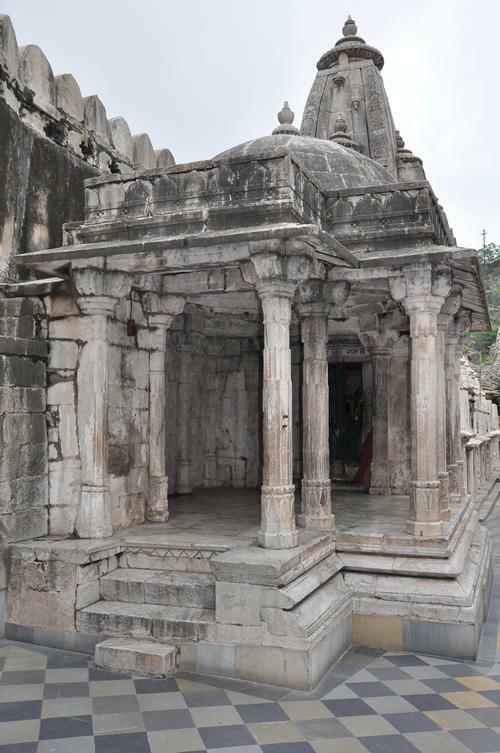 The temple has been rebuilt and refurbished by several Maharanas, including Maharana RAIMAL (1473-1509). 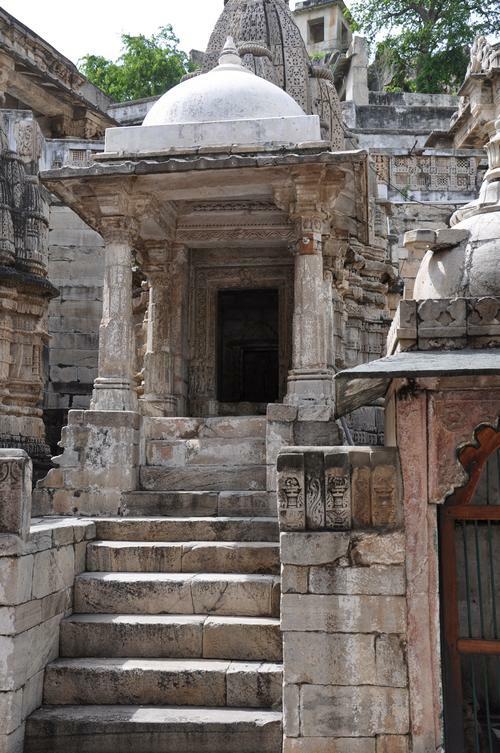 However, architecturally, the present day structure is of a later date and bears no sign of the 8th century. 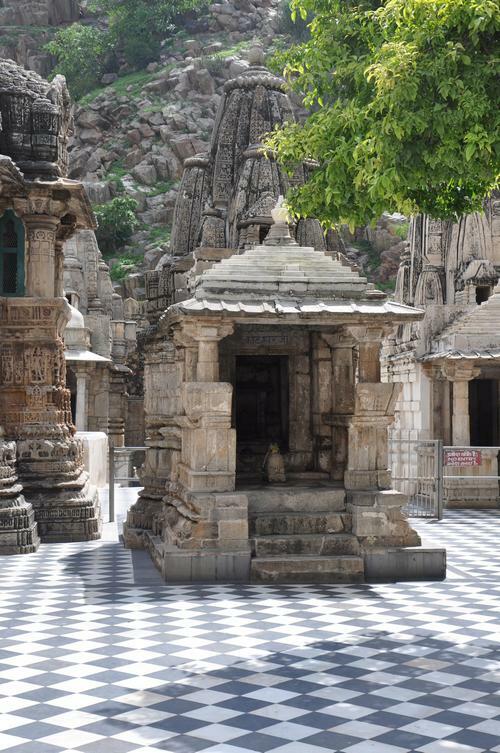 It is made entirely of white marble. 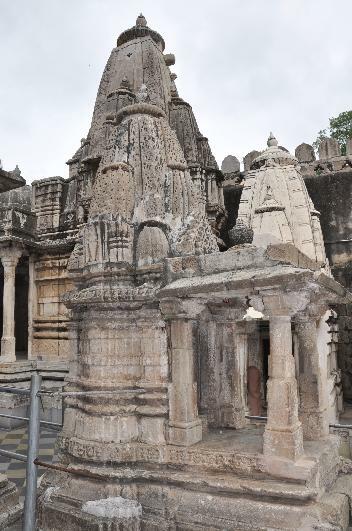 The walled boundary of the temple has 108 shrines as well as the main shrine, which consists of a double-storeyed porch and sanctuary, an elaborately pillared hall, and a flat, pyramidal roof that is adorned with hundreds of circular knobs and crowned by a tall tower. 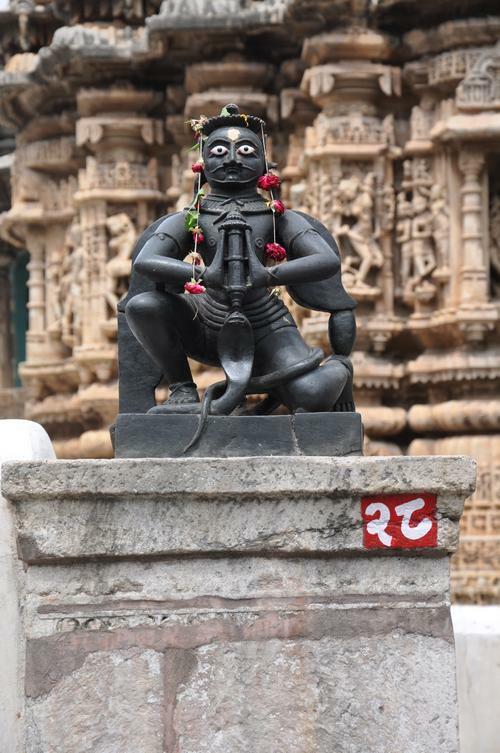 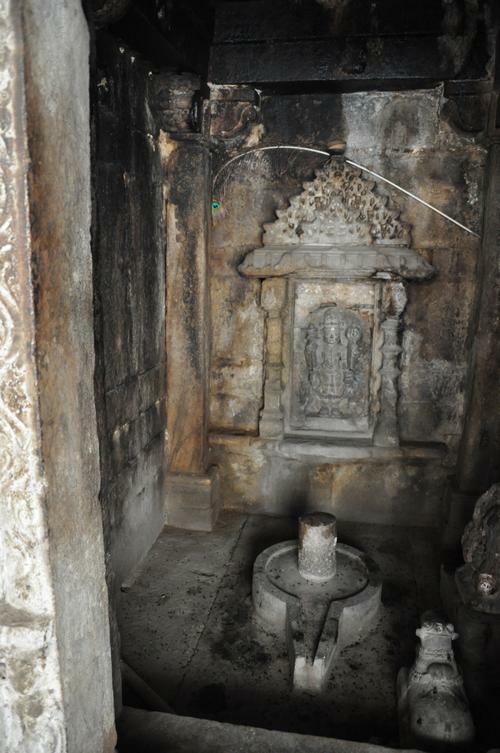 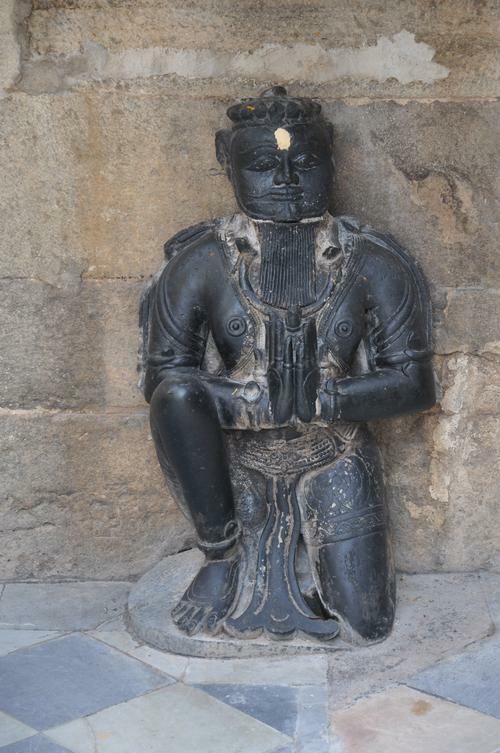 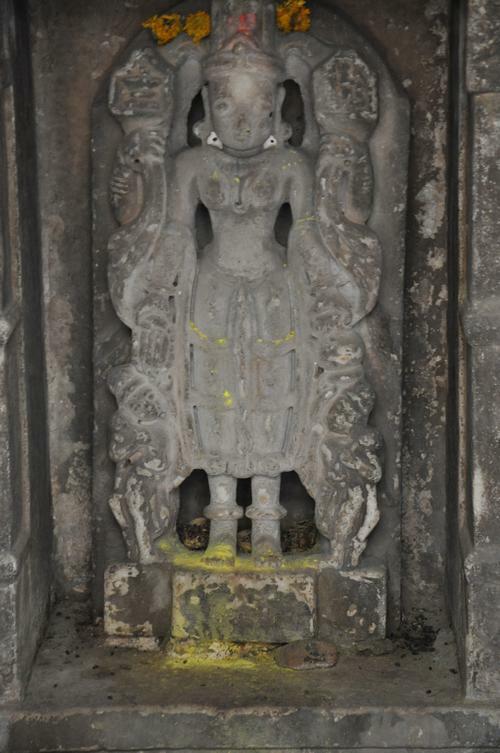 A four-faced idol of Lord Eklingji, made of black marble, is in the inner sanctuary. 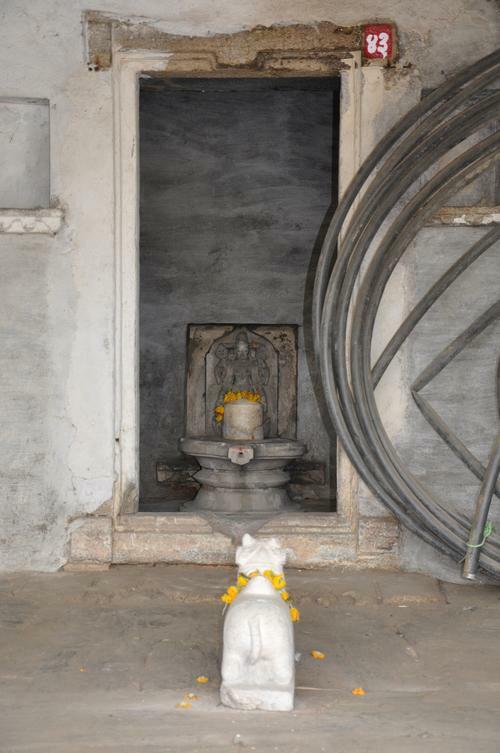 Outside the temple is a small silver statue of Shiva's sacred bull, NANDI. 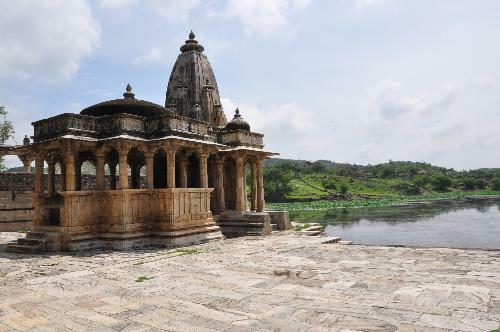 The temple complex is located on the shore of Indersagar Lake. 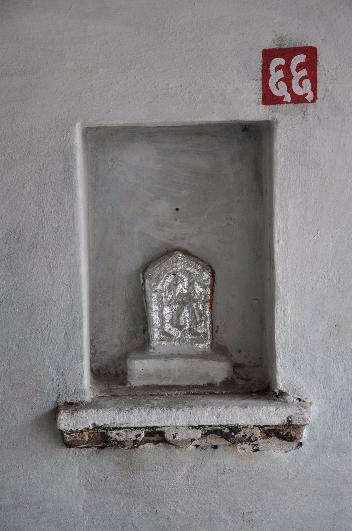 About 1 k.m. 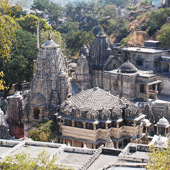 beyond the temple is the cave of Bapa Rawal, which is now a pleasant picnic spot. 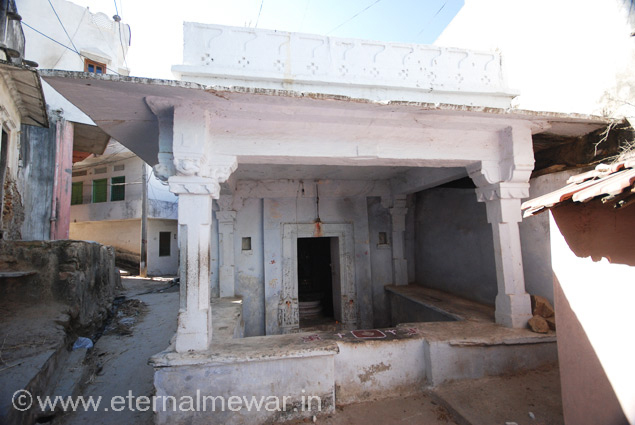 Mewar's Maharanas regard themselves as the Diwanji (Diwan, Trustee) of Eklingnath ji: the deity is regarded as the real ruler of the state and any power that the Maharana possesses is by virtue of his being a representative of Eklingnath ji. 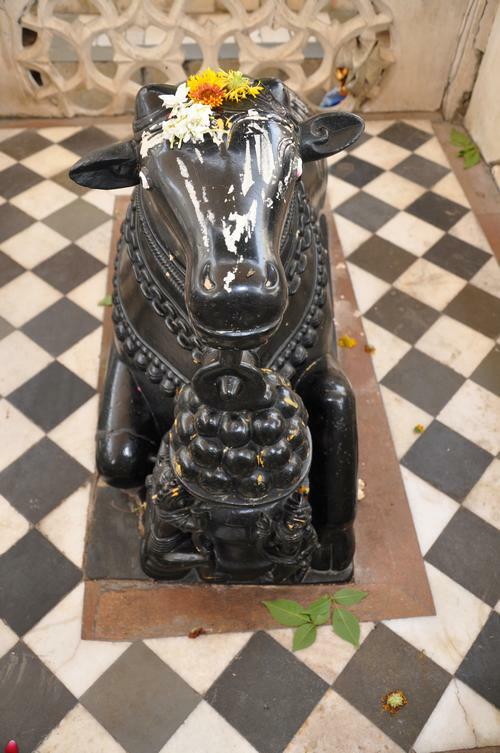 Their association with this God has been explained by an inscription recently found in the temple of Natha, the Lord, now used as a storeroom of the temple. 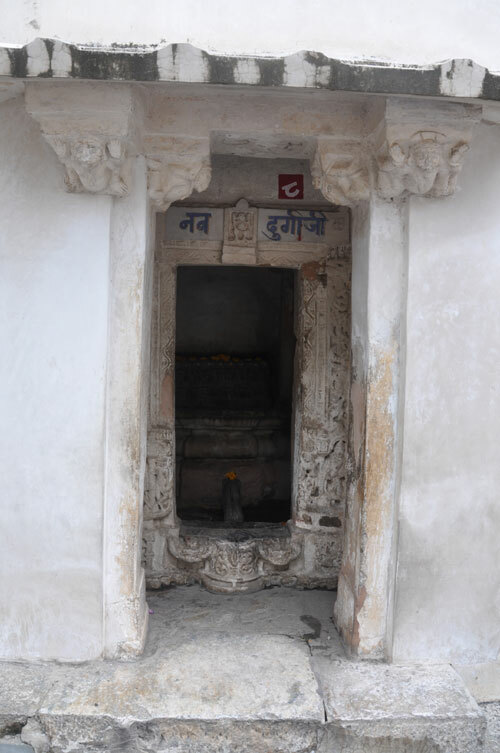 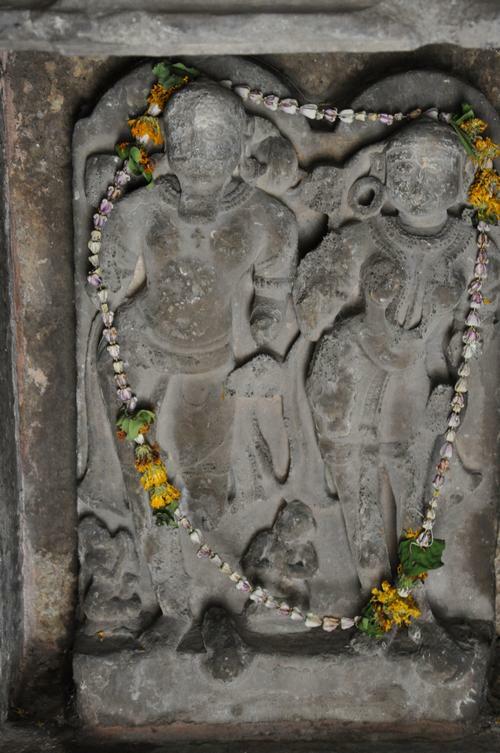 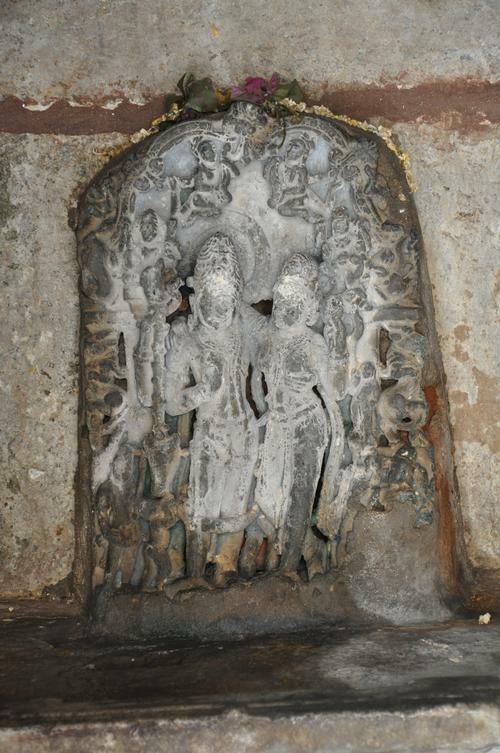 The inscription, dated AD 971, is dedicated to Lakulisha, a form of Shiva represented bearing a club, and refers to the Shaiva sect known as Lakulisha-Pashupatas. 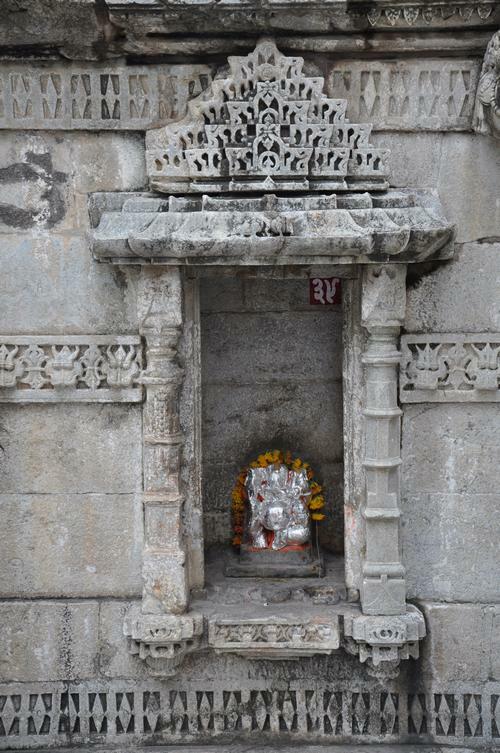 It records the name of a king named Sri Bapaka (Bappa Rawal), "the moon among the princes of the Guhila (Guhilot) dynasty", who "reigned" at a place named "Nagahavda" (Nagahrada or Nagda). 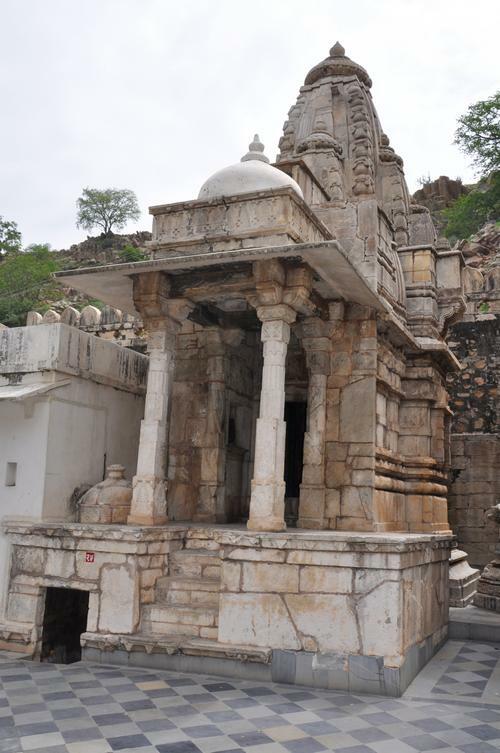 Actually, Bappa Rawal's capital was Chittorgarh, but his childhood was spent in Nagda, which was the capital of his ancestor, RAWAL NAGADITYA. 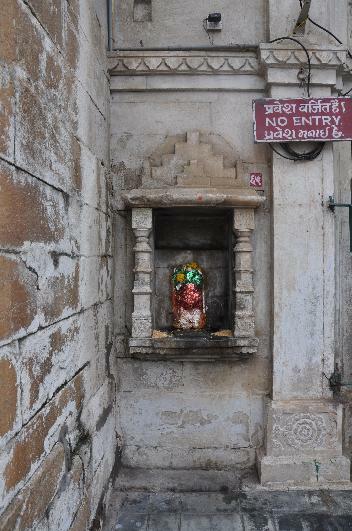 Traditionally, the Maharanas of Mewar have visited the temple each Monday night (Shiva's day) to worship the deity. 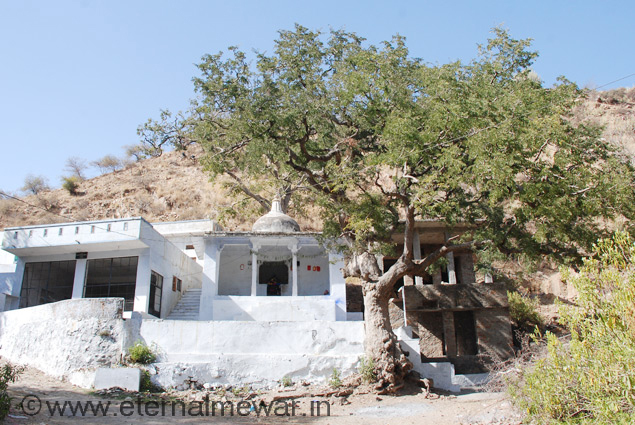 Shree Eklingnath ji Temple is one of the most important centres of pilgrimage in Rajasthan. 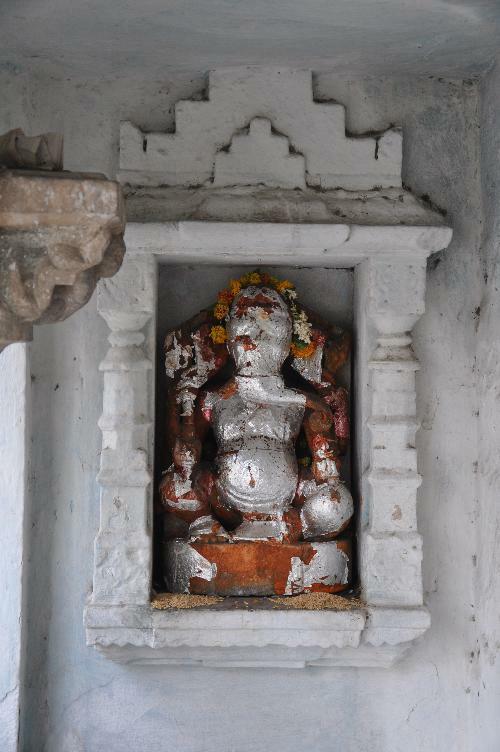 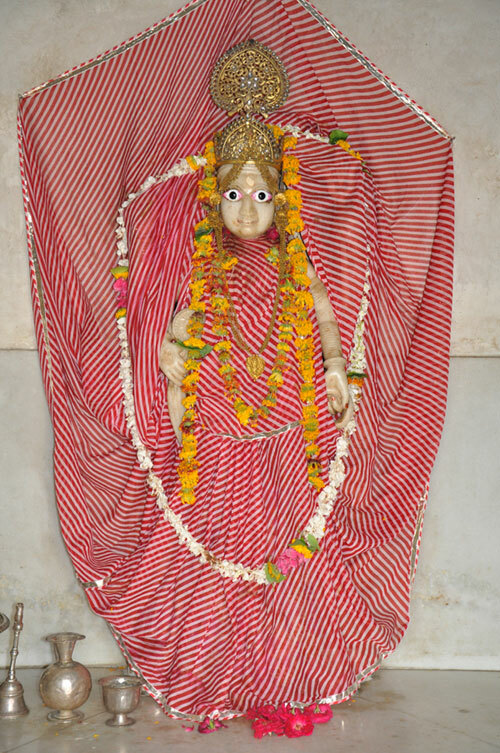 A standing idol of Shri Hanumanji on a round chabutra situated on the right side of the inner chowk.